I’ve decided what my main save is going to be once the FM19 Winter Update is available. I’m going to do a Director of Football Challenge with Derby County. 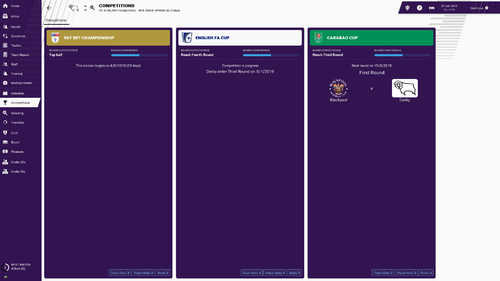 I’ve never done the Director of Football challenge before so I’m excited as it’s going to be something different for me. Derby County owner Mel Morris is going to bring back Rams legend Igor Stimac as Director of Football and Igor will have responsibility for all transfers in (senior and youth), all transfers out (senior and youth), as well as contract renewals. That worries me a little. Igor was an amazing player for the Rams, an inspirational captain and leader, but his non-playing career hasn’t been that impressive. I’ve not looked what his attributes are in FM but imagine they’ll reflect his non-playing career so far. 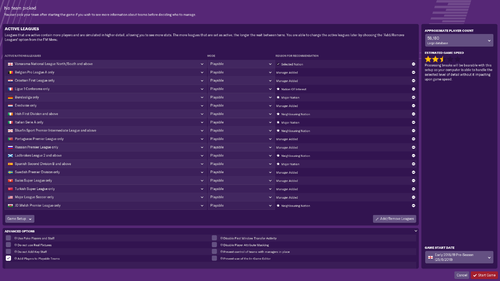 With a lot of senior players out of contract in June 2019 that could be very interesting. The only change I’m going to make to Igor in the pre-game editor will be to mirror the owner’s non-player tendencies that relate to club philosophies so that owner and Director of Football are looking to achieve the same thing. On the other hand, the Rams do have some exciting young players coming through so I’m looking forward to that as youth development is one of the club philosophies. Thank you @phnompenhandy. It could be a short save though if I get sacked early. Derby County Football Club can confirm that Gary Rowett has left the club after the Rams agreed to release him from his contract and join Stoke City. Well we know how Rowett's move to Stoke worked out. Former Rams legend, Igor Stimac, is in the running to become the next Derby County manager. Stimac told Radio Derby he would be “ready for the challenge” if the opportunity arose. Replace Frank Lampard as Derby manager. 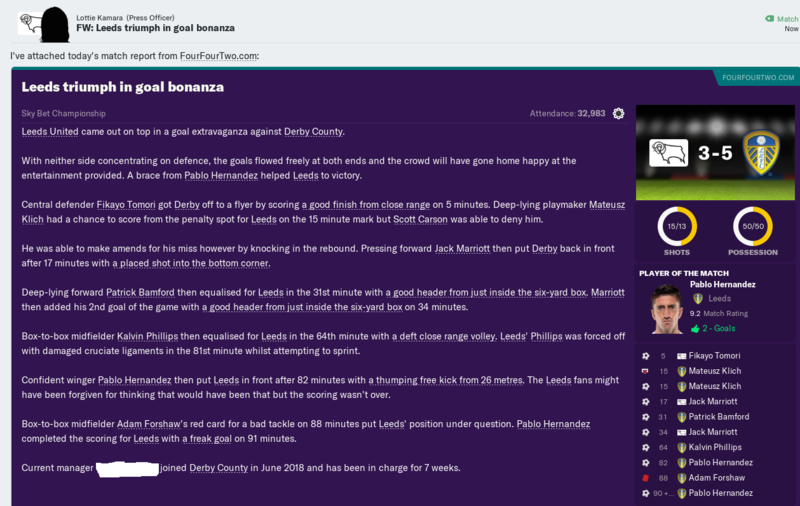 Yes, just do a straight forward take charge of Derby County, meaning all Lampard’s signings stay at Derby. Let Frank Lampard take charge of Ipswich Town (he was reported as being interviewed by Ipswich prior to being interviewed for Derby), returning Nathan Jones to Luton (was it? ), and take the high profile loan signings of Harry Wilson and Mason Mount, plus Ashley Cole to Ipswich Town with him. All other signings Lampard made remain as Derby players. Similar to Option 2, except the older Lampard signings (Martyn Waghorn, Scott Malone, Florian Jozefzoon) also go to Ipswich with Frank Lampard. Or Option 4 which I’ve only just thought of. Demote Frank Lampard to AM, and Jody Morris to FTC, and keep everything else the same. I want to keep the younger, lower profile, Lampard signings at Derby because these fit with the club philosophies: George Evans, Jack Marriott, Duane Holmes, Fikayo Tomori (loan). I will probably use the pre-game editor to remove (or move to Ipswich, depending on option selected) the Backroom staff Lampard brought in, allowing Igor Stimac to recruit his ex-Rams teammates Aljosa Asanovic, Stefano Eranio and Mart Poom. Thoughts, and any other suggestions, would be welcomed. Frank Lampard was interviewed for the job, and was believed to be a serious contender, but misses out as Ipswich opt to go for experience. Lampard remains in the running for the managerial vacancy at Derby County. Derby County owner Mel Morris has announced the appointment of Frank Lampard as the new manager of the Rams, replacing Gary Rowett who left for pastures new with Stoke City. RamsFanzine understands that Morris had narrowed the choice down to a shortlist of three with Lampard narrowly edging out ex-Derby player and Rams legend Igor Stimac for the job. The third name on the shortlist has not been named and is thought to be an extreme left field option. Lampard brings his own Backroom staff to Pride Park as he’ll be joined by Jody Morris (Assistant Manager), Chris Jones (Coach), Shay Given (Goalkeeping Coach) and Stephen Rands (Chief Data Analyst). Rams Fans will be hoping Lampard can lead Derby County back to the Premier League in his first job as manager. With the release of the 19.3.0. 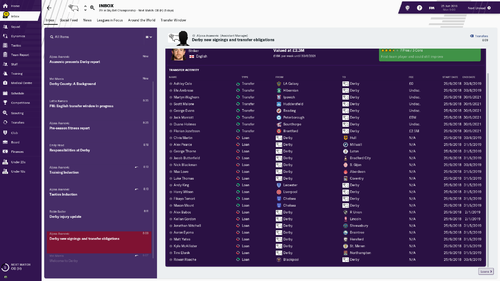 Winter Update, I can now prepare for this save. 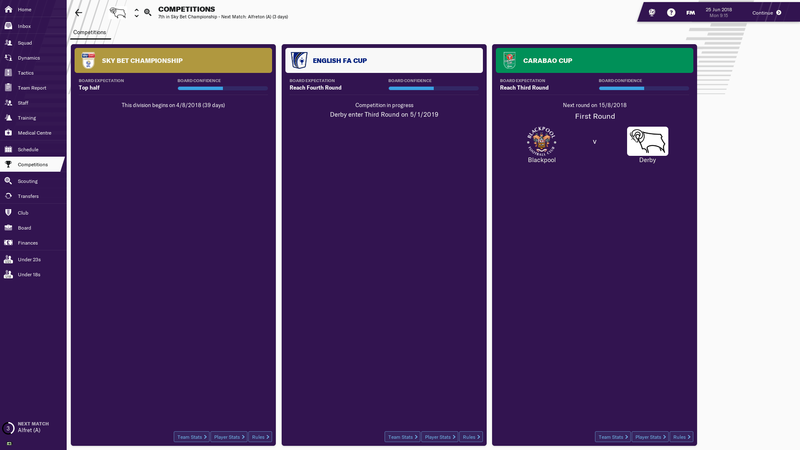 I’ve never done a Director of Football challenge before and am really looking forward to it. I plan to start the save on Monday 11th March and there’ll be a few news item updates on here over the next week as I make the small tweaks needed to set-up ready for the save. Watch this space! 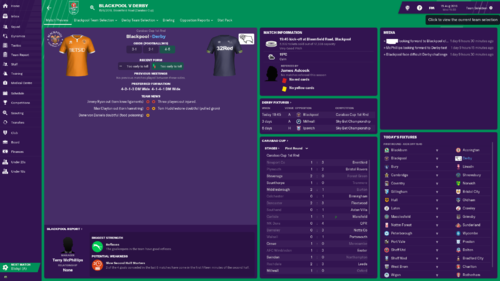 My Derby County Director of Football Challenge is coming soon! In a surprise move ahead of the FM19 2018/19 season Chelsea have sacked manager Maurizio Sarri before the Premier League has even kicked-off. Asked if a FIFA investigation into the club’s handling of youth signings and speculation about possible fines and transfer embargo had played a part in the decision to sack Sarri, the club spokesperson refused to comment. Early favourites for the Chelsea vacancy appear to be Zinedine Zidane and Frank Lampard according to the bookmakers. 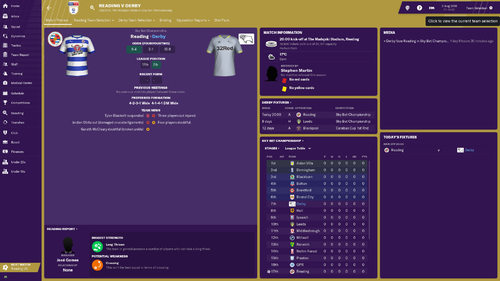 New Derby County manager Frank Lampard has wasted no time making changes to the Rams squad ahead of the FM19 2018/19 season. 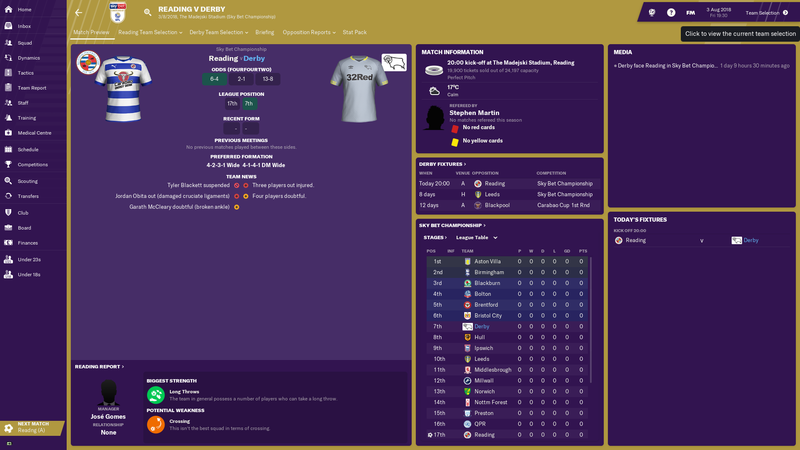 Lampard has already brought in 12 senior players plus a youth loan, whilst 25 players have left Pride Park either permanently or on loan. Incoming players: Duane Holmes, Fikayo Tomori (loan from Chelsea) Florian Jozefzoon, George Evans, Harry Wilson (loan from Liverpool), Jack Marriott, Martyn Waghorn, Mason Mount (loan from Chelsea), Scott Malone; Andy King (loan from Leicester City), Ashley Young and Efe Ambrose, plus U23 youth loan Rowan Roache* (from Blackpool). Outgoing players: Aaron Eyoma (loan to Braintree), Alex Babos (loan to Real Union), Andreas Weimann, Callum Guy, Cameron Jerome, Charles Vernam, Chris Baird (released), Chris Martin (loan to Hull City), Darren Bent (released), Jamie Hanson, Jason Shackell, Kellan Gordon* (loan to Lincoln City), Lewis Walker, Luke Thomas (loan to Coventry City), Matej Vydra, Max Lowe (loan to Aberdeen), Nick Blackman (loan to Sp. 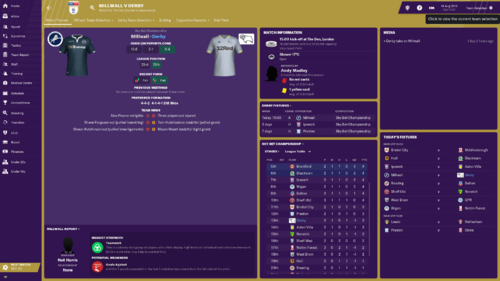 Gijon), Offrande Zanzala; Alex Pearce (loan to Millwall), George Thorne (loan to Luton Town), Jacob Butterfield (loan to Bradford City), Joe Ledley (released), Jonathan Mitchell (loan to Shrewsbury Town), Kyle McAllister (loan to St Mirren) and Timi Max Elsnik (loan to Northampton Town). Aaron Eyoma’s short-term loan to Braintree (real life from 8/3/19) added as season-long loan. Chelsea have today announced club legend Frank Lampard as their new manager succeeding Maurizio Sarri. 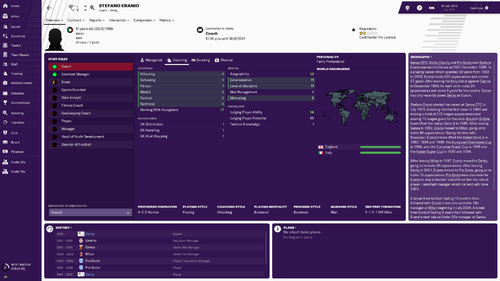 Lampard, who has yet to manage a competitive match in FM19 has left Derby County with the club’s blessing. Chelsea approached the Rams for permission to interview Lampard and, after permission was granted, Lampard impressed at his interview. Also leaving Pride Park to join Lampard at Stamford Bridge are assistant manager Jody Morris, first-team coach Chris Jones, and goalkeeping coach Shay Given. Stephen Rands, who joined Derby County with Lampard as Chief Data Analyst is believed to be staying at the Rams. RamsFanzine expect Rams legend Igor Stimac to be announced as Lampard’s successor imminently. RamsFanzine: Following the surprise departure of manager Frank Lampard and his Backroom staff for Chelsea, Derby County have announced the return of Rams legend Igor Stimac. Stimac was signed by ‘The Bald Eagle’ Jim Smith in November 1995 and captained the Rams to promotion to the Premier League that season. In total Stimac made 84 appearances in an injury plagued Rams career, scoring three goals. The Croatian is regarded as an icon by the Rams fans and will be welcomed back. Widely expected to take over the manager reigns, Stimac will join Derby as Director of Football. Joining him, and also returning to Derby, are some of Stimac’s teammates during the most successful Premier League era of the Rams history. Aljosa Asanovic (38 Rams appearances, 5 goals) joins as assistant manager, Stefano Eranio (95 Rams apps, 7 goals) joins as first team coach, and goalkeeping coach sees the return of Mart Poom (146 Rams apps). Taking up the reigns of manager will be Stuniverse although RamsFanzine understand this will be more of a head coach role with Stimac having full responsibility for all recruitment decisions regarding the Derby County playing staff. The save will start in earnest on Monday 11th March. 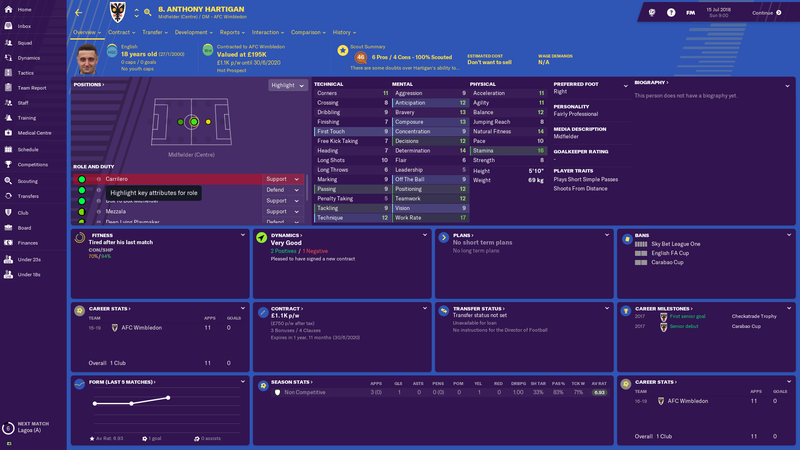 Aaron Eyoma’s short-term loan to Braintree (real life from 8/3/19) added as season-long loan 25%. 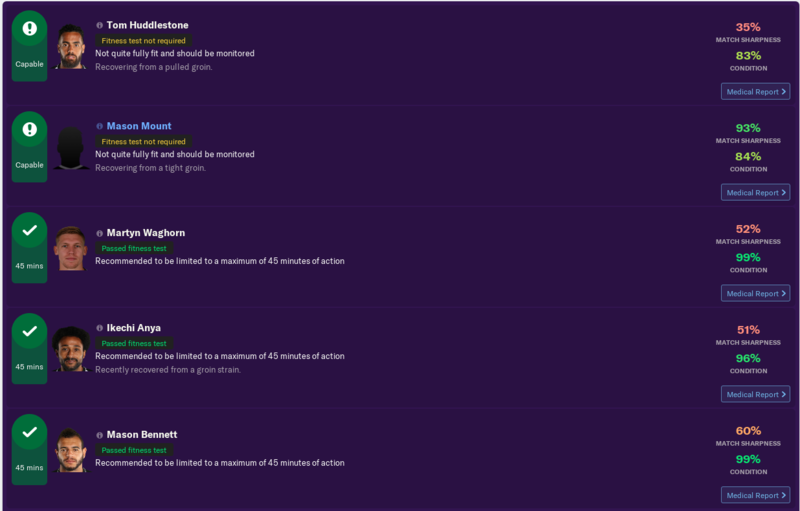 Frank Lampard (M), Jody Morris (AM), Shay Given (GkC), Chris Jones (FTC) all added contracts to 31/06/2021. Stimac, Asanovic, Poom and Eranio all made teammates, fluent English, and Derby County favoured club (player), Board Confidence = 200. Preferred formation 4-1-4-1 DM Wide, Second formation 4-2-3-1, Defensive formation 5-3-2 WB and Attacking formation 4-4-2 Diamond Narrow. As this is a Director of Football Challenge, here's my Director of Football Igor Stimac. Basically Igor will take care of all player ins and outs and will also decide who to offer new contracts to and who to release. 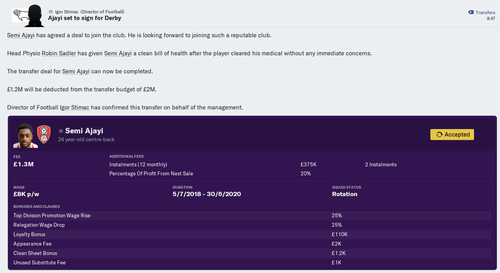 Reject a loan out if the club making the loan is NOT in a playable league. 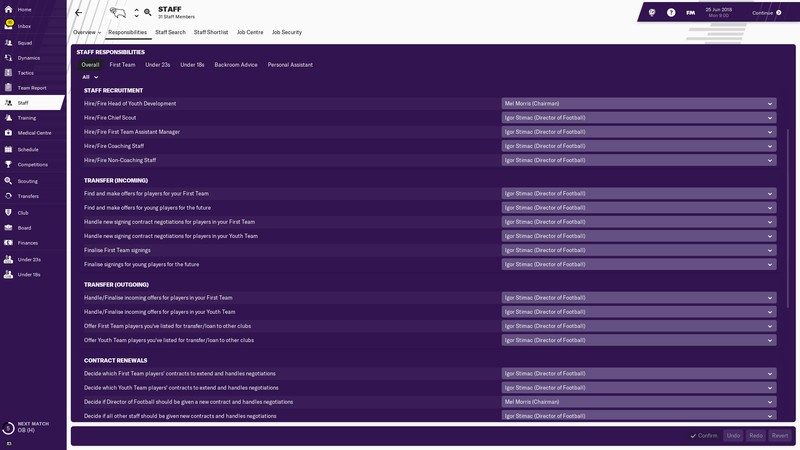 Before I took over, Frank Lampard was very busy and here's the transfer obligations I've inherited. A day after his appointment as Derby County manager, Stuniverse held his first Press Conference at Moor Farm. Stuniverse: As a life-long Rams season ticket holder, this is a dream job and a wonderful opportunity for me. I'm delighted to be part of this project working with Mel [Morris], Igor [Stimac], Aljosa [Asanovic], Mart [Poom], Stefano [Eranio] and Darren [Wassall]. There's a massive job to be done here getting this great club back into the Premier League and keeping it there. It may not happen this season, we need the fantastic fans we have to understand that and stick with us because we have every confidence that together we'll get this job done, given enough time. Stuniverse: Look, as I've just said, I'm delighted to be here and working with these guys. It's a tremendous privilege for me. Igor, Aljosa, Mart and Stefano are all international footballers who've continued working in football after they retired. They deserve their three-year contracts whereas I still need to prove myself. It's an honour for me that I've been given a one-year contract and I'll do the best I can for this great club. Hopefully I'll be here for much longer than a year. You know I met Igor once, long before we started talking about this project. It was way back when he was playing for this club. We were both in WH Smiths, at East Midlands Airport and it was rather surreal really as I was wearing an Igor Stimac baseball cap at the time. He was very nice and we had a pleasant chat. 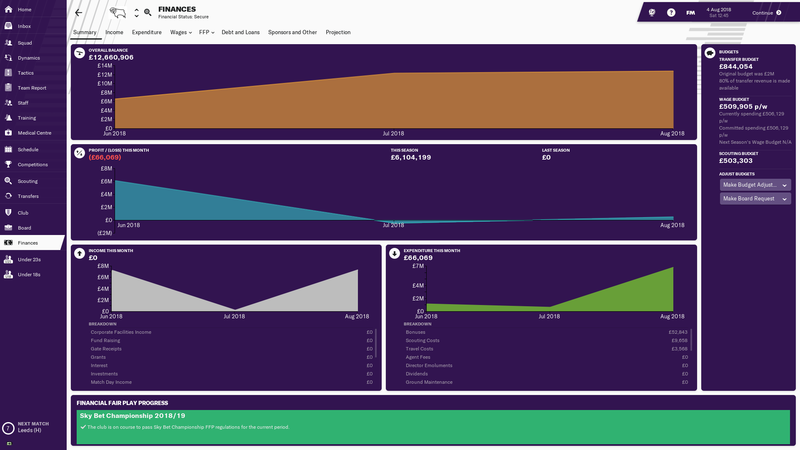 Now, talking to Igor about this project, his passion for this club, and his desire to make this project a success, shines through like a beacon. 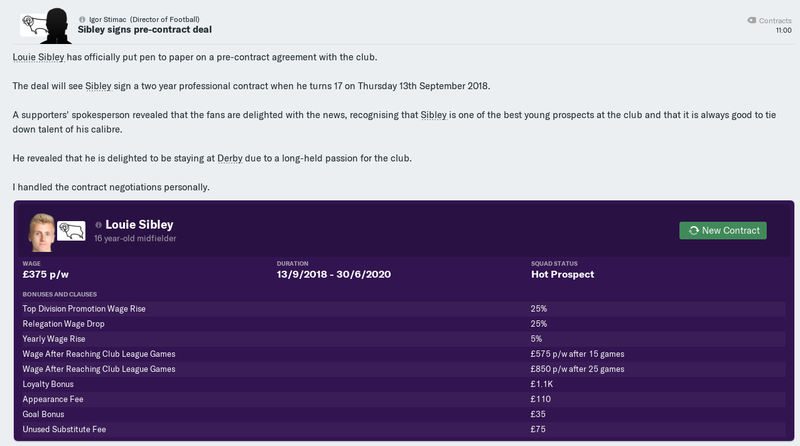 Igor will tell you himself he has 'unfinished business' at Derby County and I'm proud to be here to help him bring this club the success it deserves. Derby County are a big club, and at a big club there's far more to be done than one person can possibly do. And if we're to be successful and achieve our aims, then we need a team of people working on this and that's why we've all come together. We all have our jobs to do and we'll do them to the best of our abilities. It's Igor's job to build a squad capable of getting us into the Premier League and keeping us there. It's my job, together with Aljosa, Mart and Stefano to work with those players, improve those players, and get them playing as a team that wins football matches and wins enough points to get the job done. It's Darren's job to develop the young players into players capable of playing for the senior squad and helping us achieve our aims. Darren's already done a fantastic job with the U23s and U18s, with the help of his Academy Staff, and we're going to be taking a good, hard look at the youngsters this pre-season and we've arranged a couple of friendlies for the U23s to help us do just that - first close to home against Alfreton Town and then in a few weeks time a trip to Spain to play Real Union in the Steve Bloomer Trophy. Stuniverse: We have every confidence in this squad of players but it's too early yet to know what our squad is going to look like ahead of the opening match of the FM19 2018/19 Championship Season. 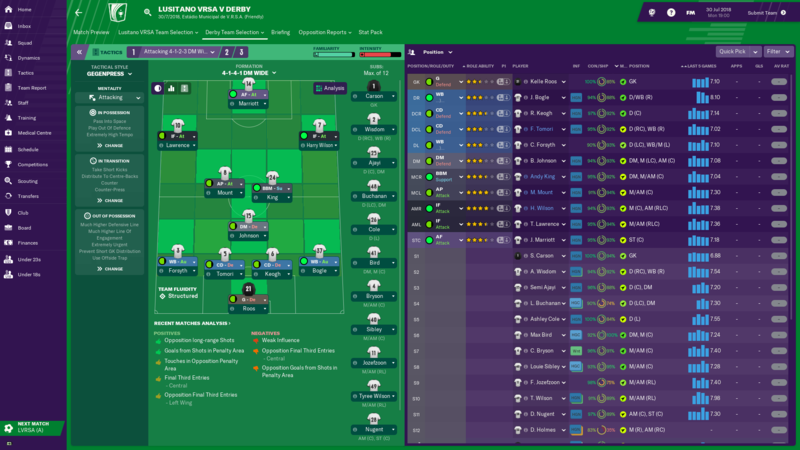 Igor's been brought in to wheel-and-deal and I'm keen to provide what input I can and see what our squad looks like in a few weeks time. 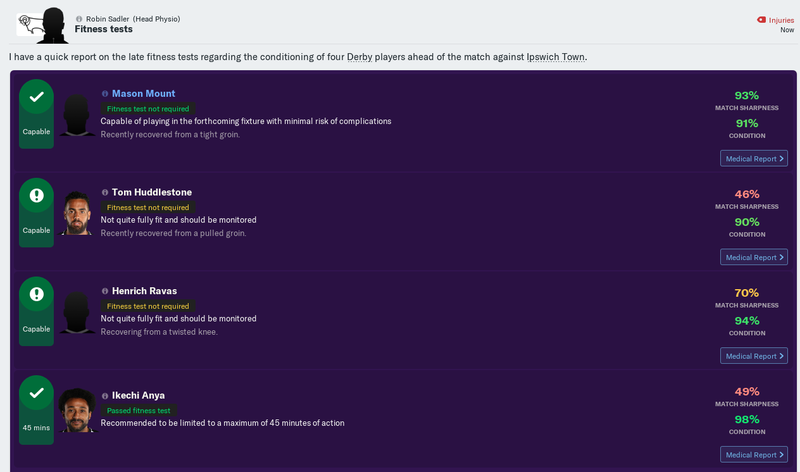 Ask me again before we kick-off the Championship season at Reading. 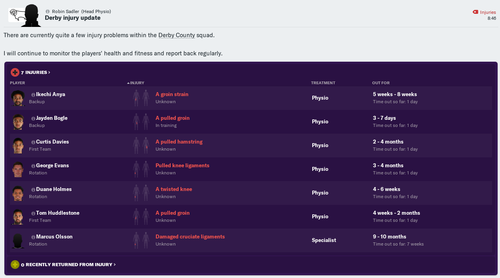 In the mean time, we have quite a few injuries including our captain Curtis Davies and the immensely experienced Tom Huddlestone and Marcus Olsson. That's the biggest thing giving me sleepless nights at the moment because right now we have the second worst injury list in the Championship. 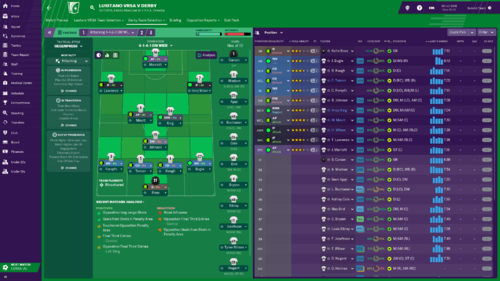 Igor [Stimac] and I sat down to review the current Derby County Senior Squad today. From my perspective it's a bit early as I've not had chance to see some of Frank Lampard's signings in action yet, particularly George Evans and Duane Homes as both are currently injured. We also haven't had an opportunity to see how the younger players adapt to training and playing pre-season games with the senior players. But Igor and the recruitment team need something to work with although I'm sure Igor will have his own ideas. 1. Scott Carson is the only experienced goalkeeper at the club. 21. Kelle Roos is his back-up, he played League Two football on loan last season. With 35. Jonathan Mitchell out on loan at Shrewsbury Town, first-year professional 47. Henrich Ravas is the third goalkeeper Mart [Poom] has to work with. I'm very happy with Carson, but we lack experience with the other young goalkeepers. 2. Andre Wisdom is the only experienced RB at the club. Young 37. Jayden Bogle is highly thought of by Darren [Wassall] and the Academy staff and we plan to take a good look at him in pre-season. Unfortunately Jayden picked up a groin injury in training today and will miss the friendly at Alfreton we arranged for the U23s. Right-back is an area I'd like Igor to strengthen. We have four very experienced left-backs in 3. Craig Forsyth, 26. Ashley Cole, 29. Marcus Olsson and 46. Scott Malone, although Olsson will be out for most of the season with an ACL injury. The big question is whether Ashley still has the legs at the age of 37, but in Fozzy and Scott I have two good options. Left-back isn't an area we need to concern ourselves with and youth looks good here as well with 25. Max Lowe on loan at Aberdeen and 39. Calum Macdonald with the squad for pre-season. Last season's vastly experienced partnership of club captain 33. Curtis Davies and vice-captain 26. Richard Keogh is going to be broken up until at least September as Davies has a pulled hamstring. Fortunately we have 5. Fikayo Tomori on loan from Chelsea and he has Championship experience after playing for Hull City last season. 12. Efe Ambrose is a new signing I haven't seen play but has good SPL pedigree with Celtic and Hibs. Second-year scholar 48. Lee Buchanan is a left-footed CB, Darren [Wassall] has recommended to us. We have the quantity at CB, but if Igor could add some quality I wouldn't mind. 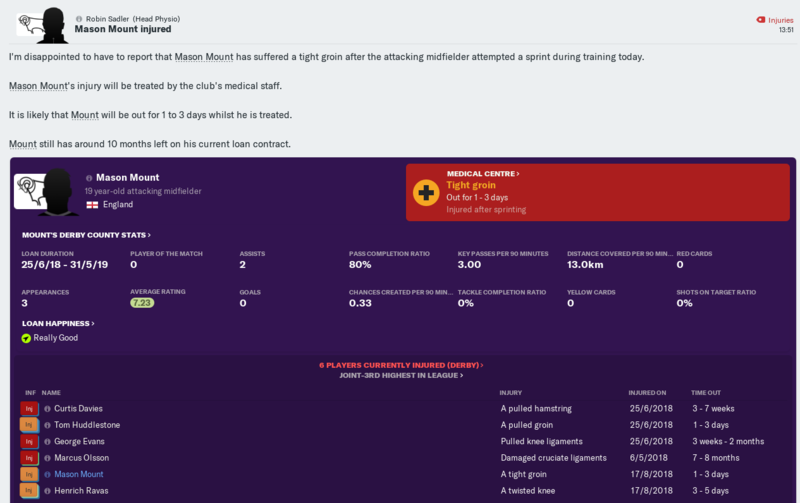 We have a short-term injury crisis at DM with new signing 17. George Evans out until mid-September with a knee injury and the vastly experienced 44. Tom Huddlestone out until August with a groin injury. That only leaves youngster 41. Max Bird who we'll be taking a close interest in during pre-season. DM is definitely an area I'd like Igor to look at. 15. Bradley Johnson may have to cover for us at DM, although it's not his best position. That would leave loanees 8. Mason Mount (from Chelsea) and 24. Andy King (from Leicester City), competing with Rams stalwart 4. Craig Bryson who experienced Championship promotion on loan at Cardiff City last season. Darren has also recommended first-year scholar 40. Louie Sibley to us and we'll be taking a look at him in pre-season. We're probably okay in CM, or at least we will be in a couple of months once George and Hudds are fit again. Liverpool loanee 7. Harry Wilson, 10. Tom Lawrence and new signing 11. Florian Jozefzoon are likely to contest two wide positions, although youngest ever Rams goalscorer 20. Mason Bennett will get his chance to impress in pre-season. New signing 23. Duane Holmes (knee) and 30. Ikechi Anya (groin) would also be challenging if not for injury. On Darren's advice, we're also taking a close look at 43. Jayden Mitchell-Lawson and 49. Tyree Wilson. We have the numbers in wide positions (as striker Martyn Waghorn can play wide too) but I'd be happy if Igor could improve the quality. With 19. Chris Martin (Hull City) and 22. Nick Blackman (Sporting Gijon) out on loan, we only have three recognised strikers on the books with new signings 9. Martyn Waghorn and 14. 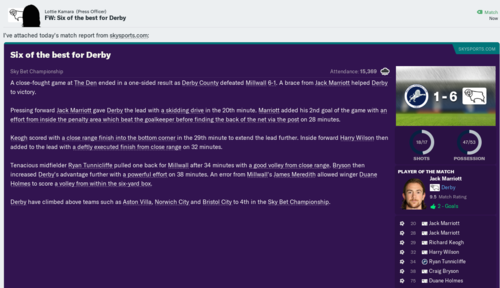 Jack Marriott plus 28. David Nugent. Mason Bennett can also play up front and we'll probably take a look at the promising youngsters Cameron Cresswell, Jack Stretton and Morgan Whittaker. We definitely lack options up front and Nuge isn't getting any younger. I'd love Igor to bring in another striker or two but they don't come cheap. Stuniverse (pre-match): I know the fans will be very keen to see my first match as manager but they really shouldn't read too much into this one as this fixture was arranged so that we could take a look at the most promising youngsters in the U23s and U18s. Unfortunately for us though, Jayden Bogle (RB), a player Darren [Wassall] rates very highly, pulled up with a groin injury during my first training session and this match has come too soon for him. 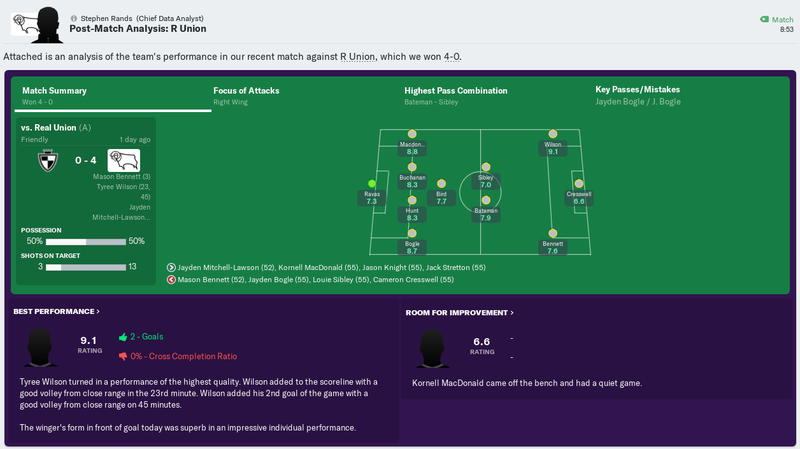 Stuniverse (post-match): This was a good work out for the young lads and I was able to see, first-hand, the great work Darren [Wassall] and his Academy staff have been doing. I thought we controlled the game. 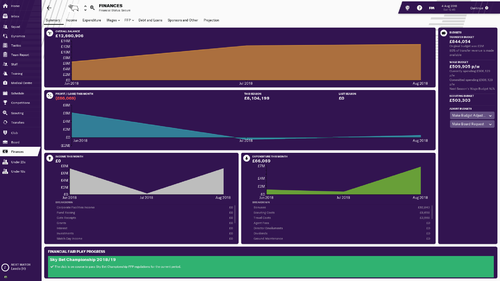 We had more possession, more shots, and more shots on target than they did. I'm not sure Henrich [Ravas] had a single shot to save. I must admit though, when Mason [Bennett] rattled the crossbar from 20-yards out, midway through the second-half, I did wonder if we'd ever break them down. 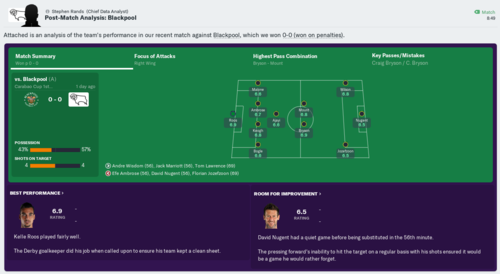 Credit to Joe [Bateman], after replacing the hard-working Jason [Knight], for having the composure to drill a long-range shot into the bottom corner. 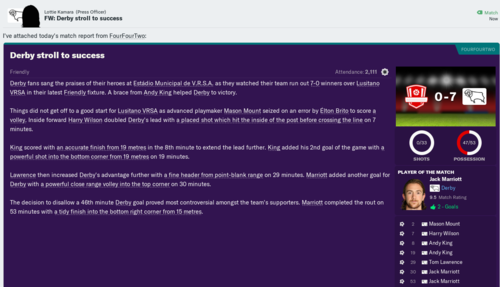 I thought we deserved to win the match and I was pleased with what I saw from the young lads. Igor accepts a loan offer from Merthyr for Jayden Mitchell-Lawson. I had no problem with this at all until I realised that Merthyr weren't in a playable league. Consequently I tried to cancel the loan and discovered I could. 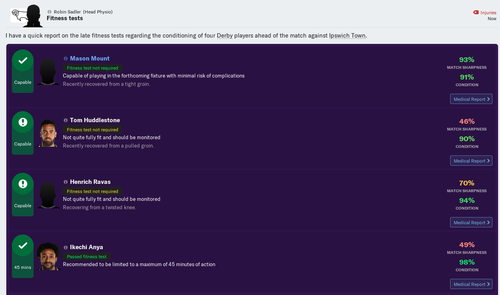 I've now added a new rule that says: 'I can Reject a loan out if the club making the loan is NOT in a playable league'. Rotherham United accept a £1.3M bid from Igor (Derby County) for Semi Ajayi. I don't know whether Ajayi is any good, or not, but as he plays CB / DM, both areas I wanted Igor to strengthen, I can't complain. It sounds though like Ajayi's agent is trying to drum up more offers for his client so the deal is not done-and-dusted yet. Igor signs youngsters Tyree Wilson (one year) and Louie Sibley (two years) up on new contracts. Derby County Director of Football Igor Stimac made Semi Ajayi his first signing for the Rams in a £1.3 million move from Rotherham United. Ajayi, who can play CB or DM, signs an £8k per week contract until 30/06/2020. My coaching staff inform me Ajayi's current ability is back-up, but that he can improve. How are you going to approach these upcoming friendlies? Stuniverse: Well, to be honest, this training camp in Portugual is more about getting the players fit and ready for a tough Championship campaign than it is about getting results, although that's not to say we don't want to win these matches because we do. 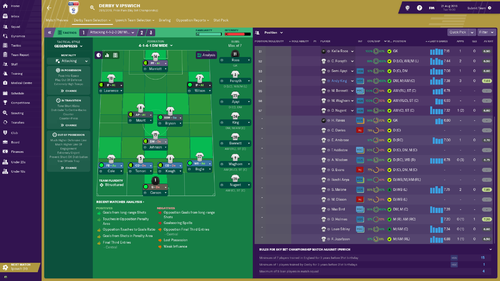 We've brought 35 players out here to Portugual but, with the exception of the Real Union match, which will be very similar to the Alfreton match with a younger squad, we'll be primarily focusing on 22 players for the friendly matches out here and back in England. 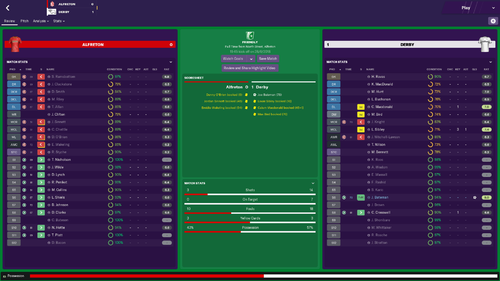 Against Odense Boldklub, we'll give the players 45 minutes each. For the Esperanca de Lagos and Boavista matches the players will get 60 minutes in one match and half an hour in the other. Then against Bayer 04 Leverkusen and Lagoa we'll aim to give them a full 90 minutes in one match or the other. That's the plan for the next five matches. Then the U23s go to Spain for the Steve Bloomer Trophy against Real Union and the we'll see where we are for the final two friendlies against Chelsea and Luistano VRSA. Stuniverse: This was a really good workout for us against a strong Danish Superliga side and I was pleased our fans got to see 22 of our players play so well. It's very early days, but already I can see the lads trying to put into practice what we want them to do. We scored four great goals, two from defenders Andre Wisdom and Efe Ambrose and two from attackers Martyn Waghorn and Florian Jozefzoon. 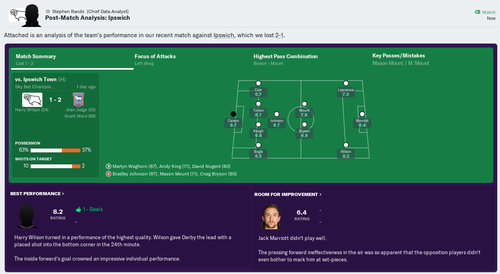 We caused them problems throughout, and were a real threat down the right flank, whilst they hardly troubled Scott Carson or Kelle Roos all evening. 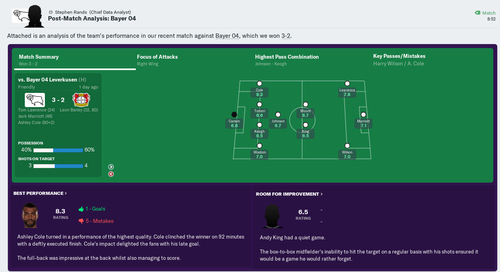 I don't like singling out individuals in friendly matches but I thought Efe did very well playing out-of-position at right-back due to Jayden Bogle's groin injury. Stuniverse: To be honest we didn't know what to expect in this match but I thought the players handled it very well and did a thoroughly professional job. To be 5-0 up at half-time was sensational and I was delighted the players kept their professionalism in the second-half and didn't become complacent. Our captain [Richard Keogh] set the tempo in the very first minute with his composed finish after Harry Wilson's free-kick had crashed back off the bar. 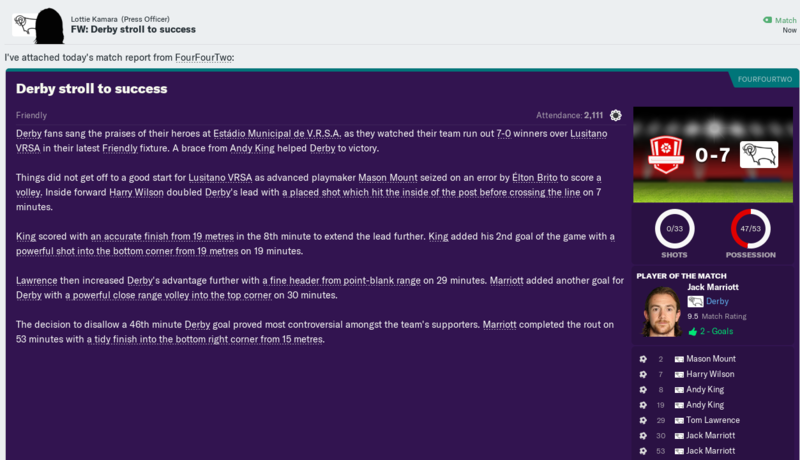 I was pleased for Harry and Mason Mount that they both scored a brace which will help them settle in as loanees here. 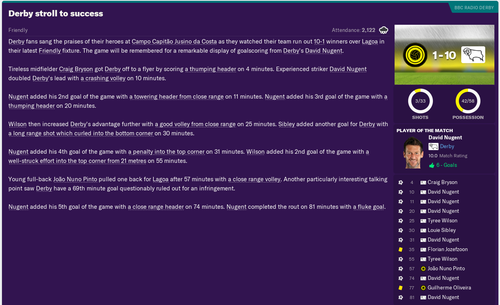 Tom Lawrence and Craig Bryson added the other two goals. 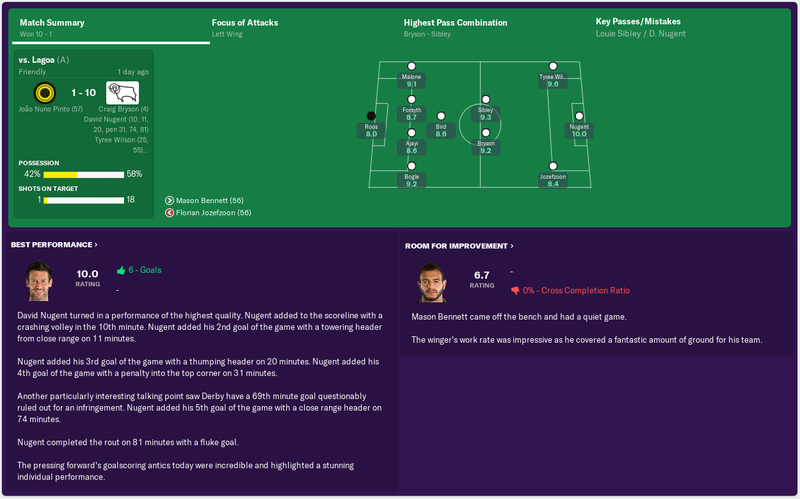 The only disappointment was Mason Bennett picking up a thigh injury. Stuniverse: We stepped up the quality of the opposition today against Portuguese Premier League side Boavista and to control the game for long periods was very satisfying and a credit to the players. To win the match with Jack Marriott's late goal was no more than we deserved. 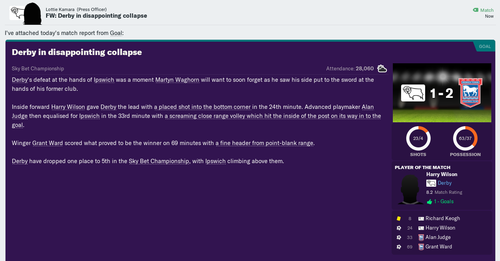 It was frustrating though to lose Martyn Waghorn to a twisted ankle just before half-time. RamsFanzine: How disappointing is it to miss out on AFC Wimbledon's Anthony Hartigan? Stuniverse: Well he was always going to be one for our U23 squad initially and, maybe, that's why the lad opted to stay at Wimbledon. 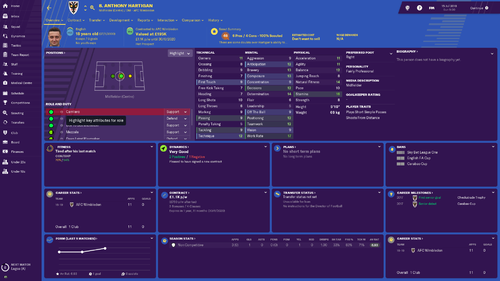 Igor made a very fair offer which they accepted and he then offered the lad what we thought was a good contract and personal terms. Wimbledon also offered him a new deal and, in the end, he chose to stay there. That's his prerogative. At least we helped the lad get a pay rise. RamsFanzine: Any truth in the rumours that you and Igor have fallen out over Efe Ambrose? Stuniverse: No, not at all [laughs]. Look Frank [Lampard] signed Efe on a free transfer before we got here but the club weren't stupid, they did their due diligence, and we already knew that he's unlikely to have his work permit renewed, even though you guys in the media have been very quick to point it out to us. Igor and I had a chat about it but the fact of the matter is that Efe is our player for the season and the club signed him on a free so it's not like we stand to lose out financially if he loses his work permit. We may have to look at things again in January but, for now, Efe is part of this squad and our plans. Stuniverse: What a cracking game that was for our home fans to see. 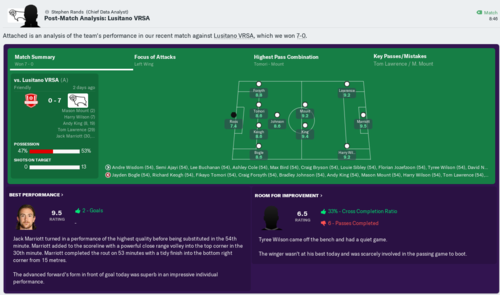 Leverkusen are a strong Bundesliga side so to see our players go toe-to-toe with them over ninety minutes, with no substitutions, made me very proud indeed. I thought we were good value. We twice took the lead through Tom Lawrence and Jack Marriott. 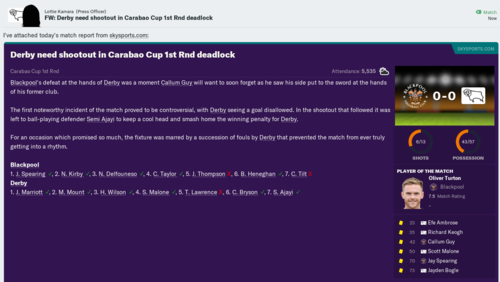 Jack's goal, just before half-time, particularly pleased me as it would've been easy for the players to settle for 1-1 at the break but they pushed on and got their reward. 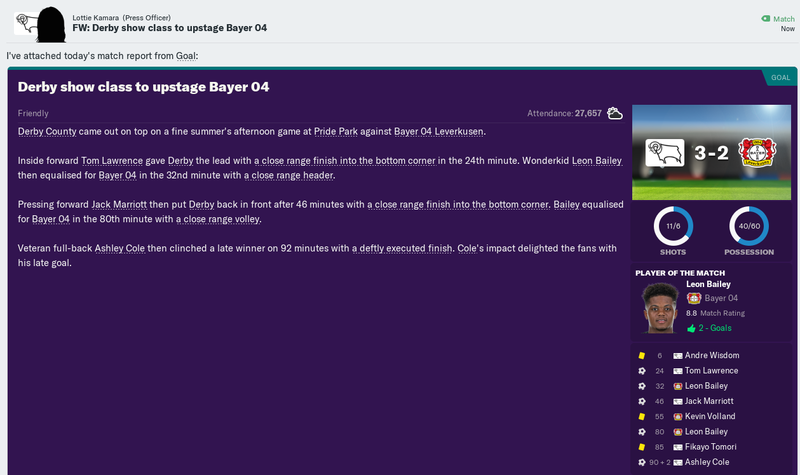 I'd made the decision to give the players a full 90 minutes, as I'll do again in the Lagoa match, and thought tiredness in the legs had caught up with us when Leon Bailey scored his second goal with 10 minutes to go. But credit our players they kept going and goodness knows how old-man Ashley Cole found himself bursting a gut into the penalty area to score a 92nd minute winner. I hope our fans enjoyed that because it was some match. Stuniverse: Wow! I hope our fantastic fans don't expect that every time we play because tonight was simply sensational. My predecessor signed two strikers in Jack Marriott and Martyn Waghorn but David Nugent gave me plenty to think about with his double hat-trick. Nuge was unbelievably clinical tonight. Like we did against Leverkusen, we gave a different group of 11 players a full 90 minutes and every single one of them put in a great shift. There were a few youngsters out there and they all impressed me. 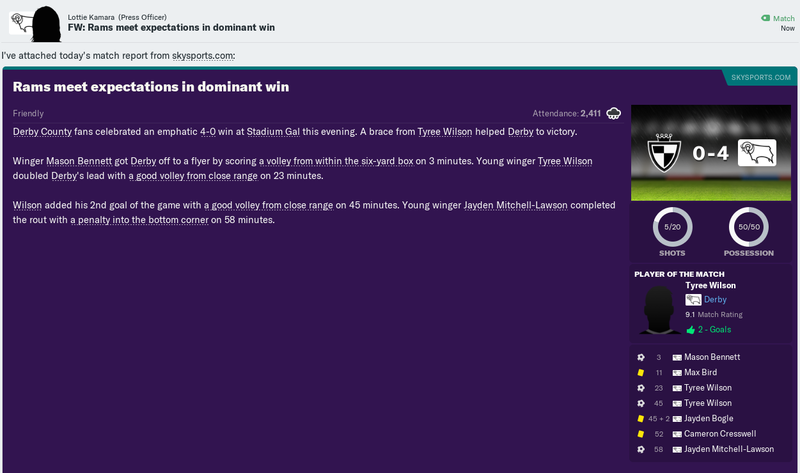 I was especially pleased for Louie Sibley and Tyree Wilson as they got themselves on the scoresheet. RamsFanzine: You've given 22 players a full 90 minutes over the last two matches but Efe Ambrose hasn't featured at all. Is this because of the concerns about his work permit renewal? Stuniverse: No, not at all. Efe pulled a thigh muscle in training a few days ago, that's the only reason he's been missing. Stuniverse: We expected this to be a very difficult game and were delighted with how comfortable and composed the young lads looked throughout. Mason Bennett got us off to a superb early start and I felt for him when he pulled up with a hamstring injury early in the second-half. 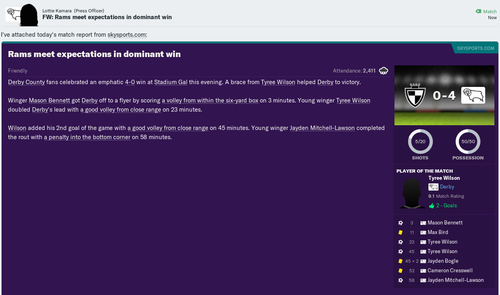 Tyree Wilson got his second consecutive brace and Jayden Mitchell-Lawson calmly dispatched his penalty. This was a good all-round team performance and our defence and midfield were superb. We even got to see the payer we've loaned them when Alex Babos came on in the second-half. It was a lovely moment for the U23s to lift the Steve Bloomer Trophy and win some silverware. Stuniverse: I think it was a very smart move by our owner [Mel Morris] to arrange this friendly as part of the deal that saw my predecessor move to Chelsea and I'm looking forward to speaking to Frank [Lampard] before and after the match. It's going to be a fantastic night and hopefully we won't let our fans down. It's a shame we won't get to see as strong a Chelsea team as we might otherwise have seen but I understand that their top players need recovery time after the World Cup. RamsFanzine: How pleased are you with pre-season so far? Stuniverse: Overall I'm very happy. The players are working hard, getting fitter, understanding more and more what we want them to do and we've won every game so far. But it's come at a cost as our growing injury list shows. RamsFanzine: Are any of those players likely to feature against Chelsea? Stuniverse: No. I don't think so. 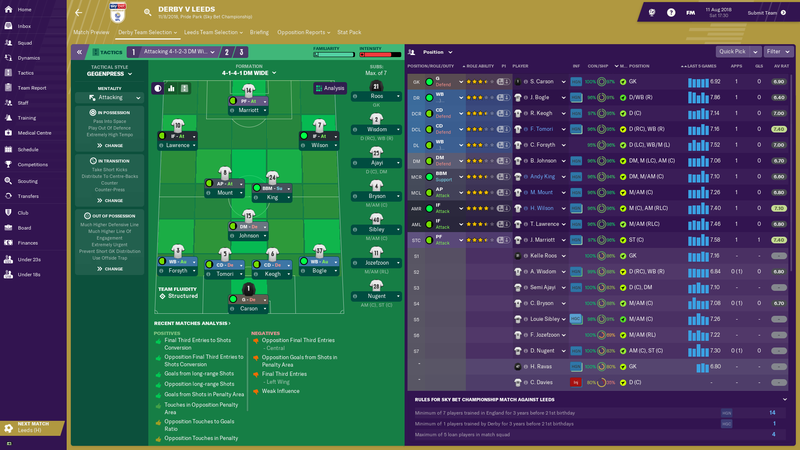 Mason Bennett, Martyn Waghorn and Duane Holmes are close but we don't want to risk making their injuries any worse a week before the start of our season. Everybody else, unfortunately, are some way off a return and some are a long way off a return. 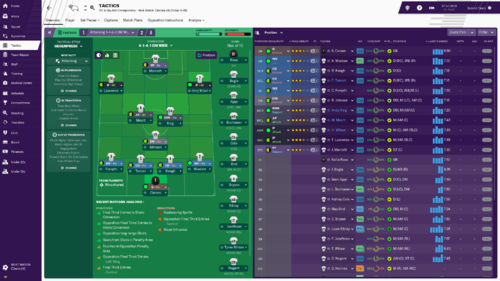 RamsFanzine: You've picked what looks a strong line-up for the Chelsea match. With your opening Championship match of the season a week away now, how close to your starting 11 for the Reading match is this selection? Stuniverse: I don't know. 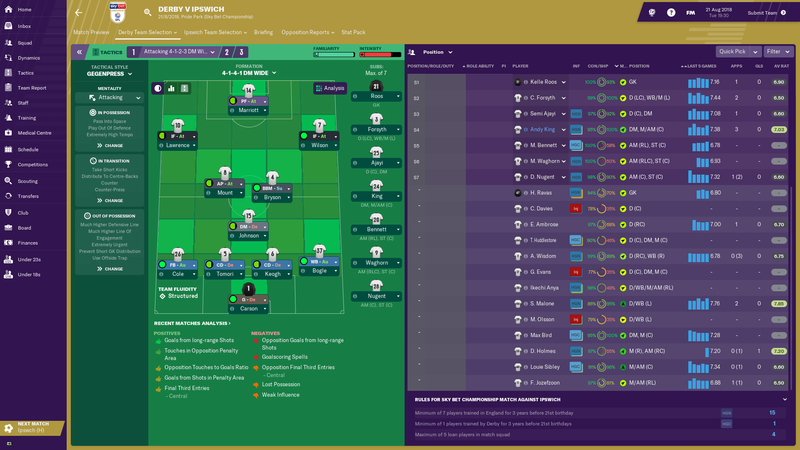 We've got two more friendlies to get through without picking up any more injuries and the players not selected today will want to start against Luistano on Monday and show me what they can do. 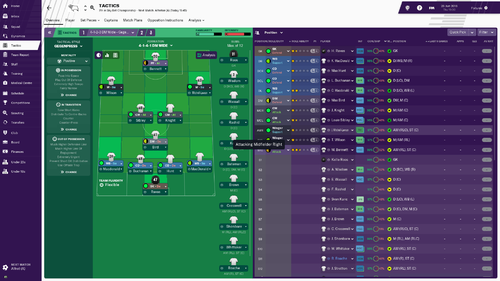 Some of the players I've picked tonight will play against Reading, some won't. 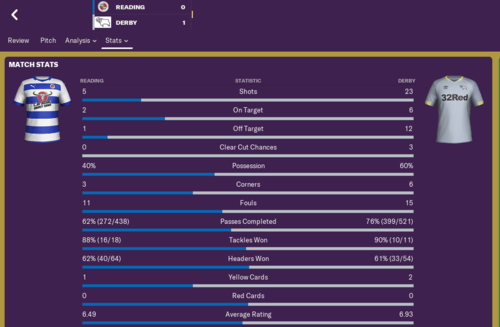 I'm not even thinking about the Reading match yet. Stuniverse: I couldn't have asked for any more from the players tonight. I thought they were brilliant. It wasn't the strongest team Chelsea could put out but it was still a strong side. And I thought our fans were amazing, over 30,000 for a friendly match is staggering when you stop and think about it. 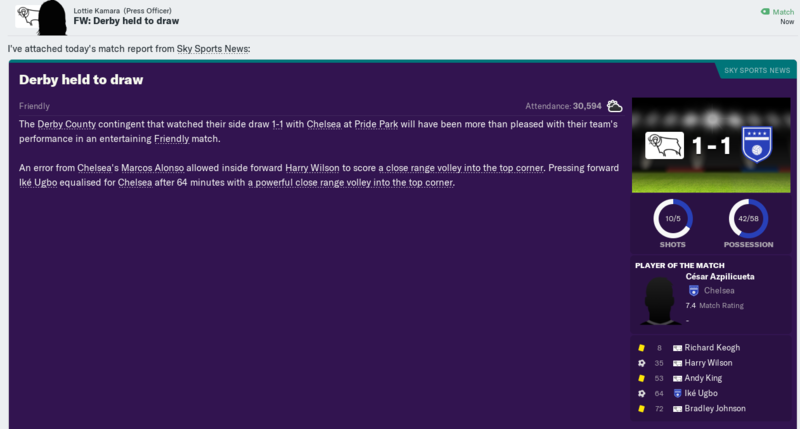 Harry Wilson scored an opportunist goal and we went to sleep a bit at the back for their equaliser. It was unfortunate that it came within about eight minutes of me changing the entire back-four, but I thought all the subs did well and it was important some of the youngsters got an opportunity to play on the same pitch as these Chelsea players. RamsFanzine: You've made just two changes from the Chelsea match - Roos for Carson and Bogle for Wisdom - does this mean you've almost decided on your starting line-up for the Championship opener? Stuniverse: No, not at all. 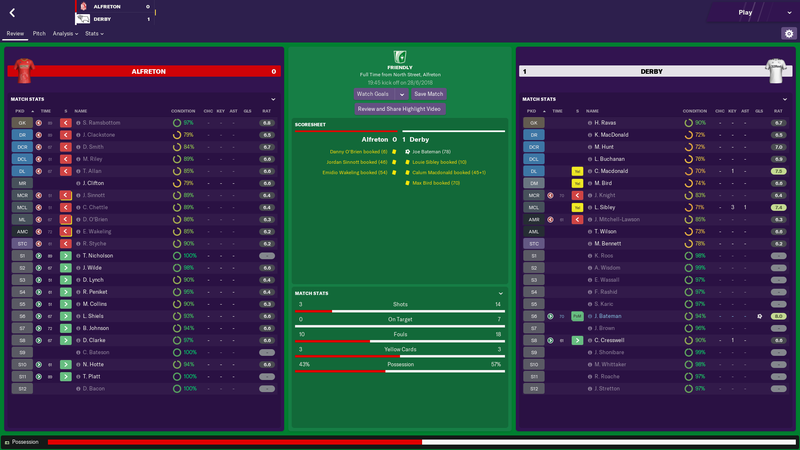 This match is going to be closer to our opening friendly when we gave the players 45 minutes each. The Reading match is in four days time so we don't want to tire the players out too much tonight. We're also hopeful the medical team will have two or three of our walking wounded back in contention for the match on Friday. 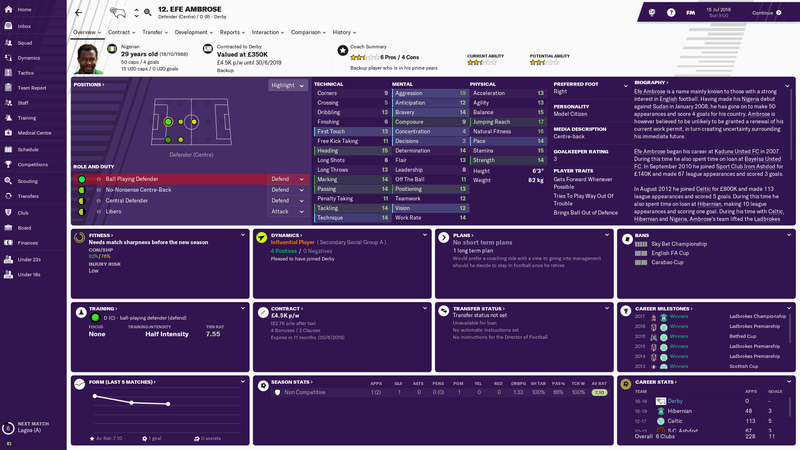 RamsFanzine: Still no sign of Ambrose? Stuniverse: Are you going to ask me about Efe every match? What about 'still no Martyn Waghorn or Mason Bennett'? Efe's still recovering from his pulled thigh muscle, as is Mason [hamstring] and Martyn [ankle]. And Duane Holmes [knee] as well. Duane is a little bit ahead of the others which is why he made the bench for Chelsea and tonight. Stuniverse: We were quick out of the blocks tonight and effectively blew Luistrano away in the first 20 minutes. 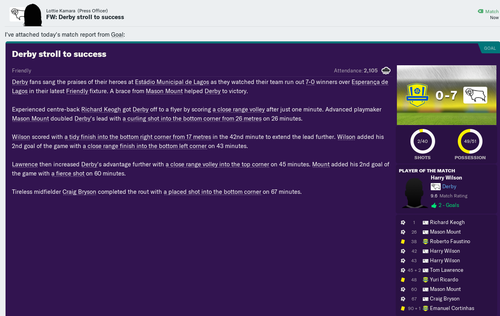 Mason Mount, Harry Wilson and Andy King had us 3-0 up after eight minutes and Andy added a second before we'd even played 20 minutes. 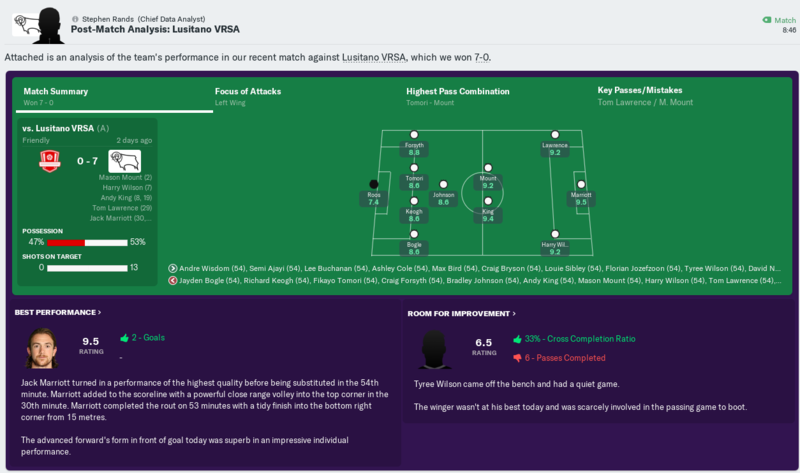 I wouldn't say we slackened off after that, I just think Luistrano were shell-shocked by our high-tempo and settled into the game more as it progressed. We scored another two goals in quick succession around the half-hour mark through Tom Lawrence and Jack Marriott. 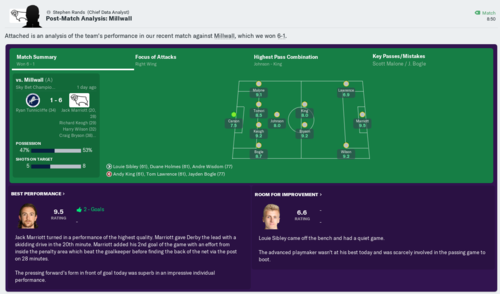 Jack scored a second goal early in the second-half and I took the opportunity to change the whole team around after that. We didn't add to the score sheet after the substitutions, but I wouldn't read anything into that as I thought all the subs did well. RamsFanzine: Experienced left-back Ashley Cole looks set to miss Derby County's Championship opener at Reading on Friday after leaving training early today with a tight calf. RamsFanzine: Promising Rams youngster Joe Bateman has today joined Vanarama National League North side Guiseley on-loan for the season. Bateman came off the bench to score the winning goal in the U23s friendly at Alfreton Town and generally impressed, receiving rave reviews. It would appear though that Bateman didn't figure in the plans for this season as Director of Football Igor Stimac has sanctioned the loan move for the whole season. Bateman is out-of-contract in the summer which raises questions about whether he has a future at Derby County. 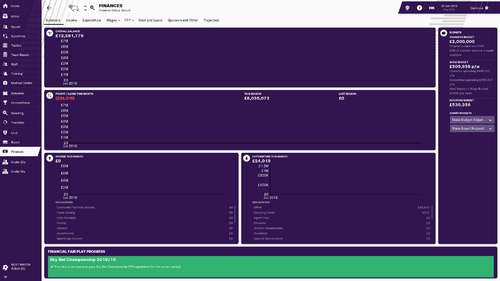 On this save it's the job of my Director of Football, Igor Stimac, to look after the club's finances and keep us within Financial Fair Play. 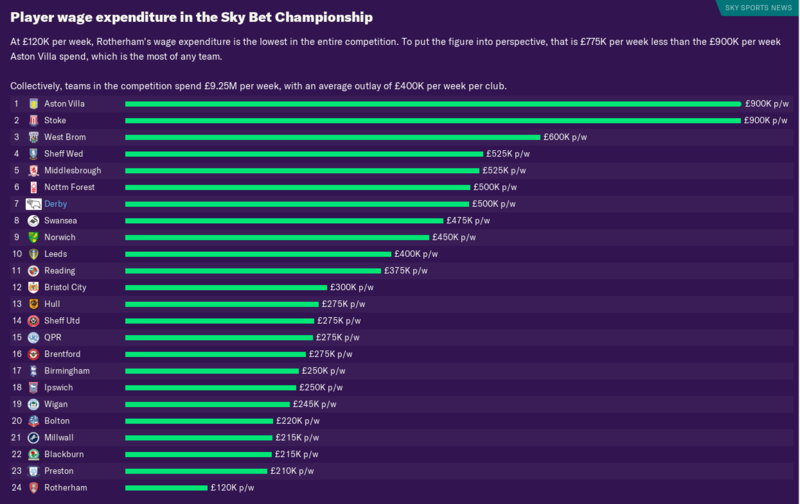 The good news is Derby County are predicted to pass the Championship FFP regulations for the current period. 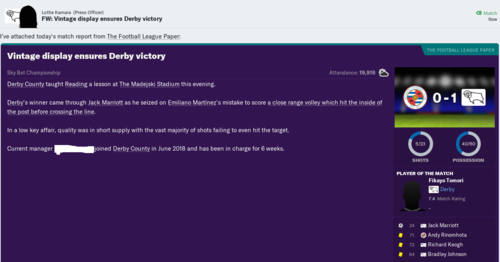 RamsFanzine: How do you think pre-season went? Stuniverse: I was very happy with pre-season. The players worked hard on their fitness and putting into practice what we are trying to do. We were unbeaten in nine games - seven for the first team, two for the U23s, and the young lads lifted the Steve Bloomer Trophy. RamsFanzine: You scored 10 goals against Lagoa and put seven past both Esperanca de Lagos and Luistano. 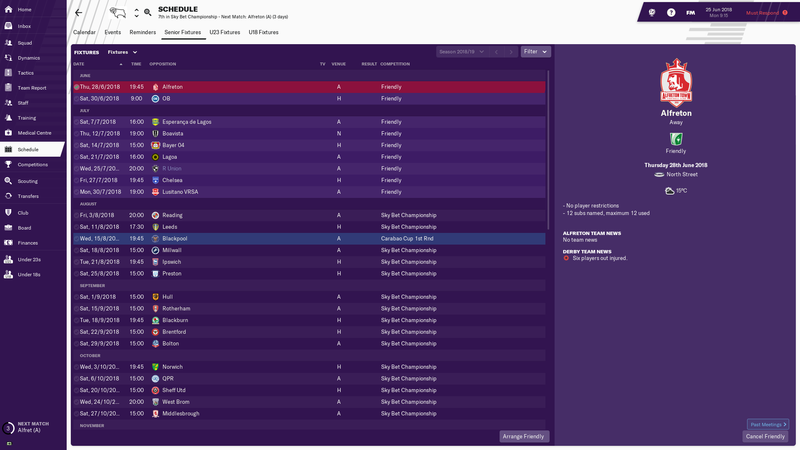 What would you say to those who say your pre-season campaign wasn't challenging enough to prepare you for the rigours of a tough Championship season? Stuniverse: I think comments like that are unfair on us and very harsh on our opposition. We were simply sensational in those matches. The most dificult thing to do in professional football is to score goals. Getting four in a match is difficult, let alone seven or 10. Ask David Nugent how difficult it is. Nuge got a double hat-trick against Lagoa and that's something special. We also played teams from the top division in Germany, Portugual, Denmark and England, winning three and drawing one. 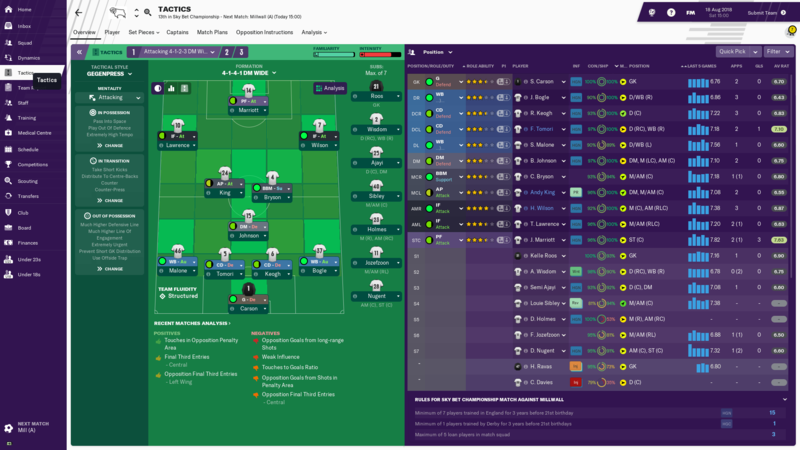 RamsFanzine: What are the club's expectations for the season? Stuniverse: It's like I said when I got the job, we all want to get this great club back into the Premier League where a club like Derby County should be. I've had good chats with Mel Morris [Owner] and Igor Stimac [Director of Football] and we're determined to get promotion and then stay up once we get there, but there's no expectation to achieve that this season although we'll be working hard towards that aim. I've also spoken at length with the players and the coaching staff and we all want to challenge for the playoffs this season. 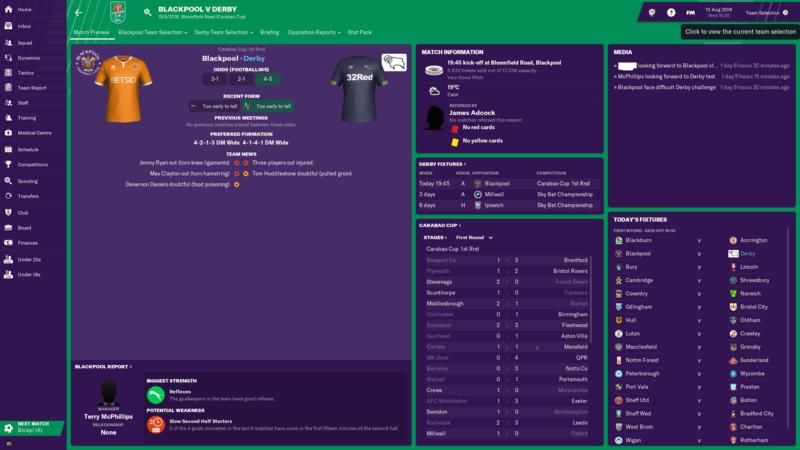 RamsFanzine: You're about to manage your first competitive match as Derby County manager away at Reading tonight, when everybody else play tomorrow. Your thoughts? Stuniverse: It's an honour and a privilege to manage the club I've supported all my life and we now need to put into practice competitively what we've been working on in pre-season. Playing first means we'll end the day either top or bottom of the league at least until the others have played. But it's a long season, so win, lose or draw I wouldn't read too much into one result when we have 46 matches to play. RamsFanzine: How are the injuries looking? Stuniverse: We'll be missing quite a few. Ashley Cole (calf), Efe Ambrose (thigh) and Duane Holmes (knee) are close, but we won't be rushing them back and risk setting their recovery back. 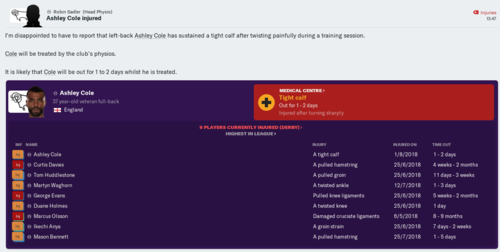 Martyn Waghorn (ankle), Mason Bennett (hamstring), Tom Huddlestone (groin), Curtis Davies (hamstring) and Ikechi Anya (groin) will be a bit longer. George Evans (knee) will be even longer and Marcus Olsson (ACL) will be out for most of the season. Stuniverse: We're delighted to get off to a winning start but that was a difficult match, make no doubt about it. We started brightly and Emiliano Martinez pulled off some fine saves to deny us. 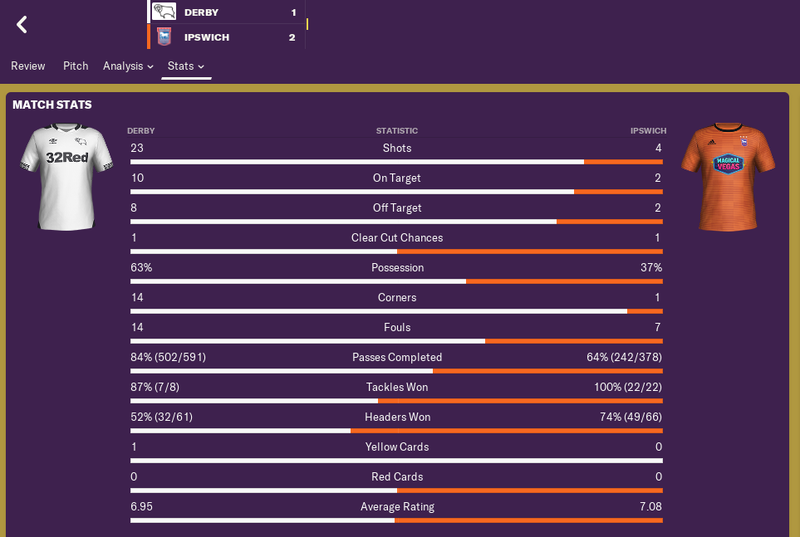 It looked like being one of those nights when a goalkeeper in superb form kept a clean sheet against us so it was a great moment when Jack Marriott slid the ball underneath the keeper to give us the lead. After the break Reading put us under a lot of pressure without really causing us too many problems. RamsFanzine: Is that why you brought on Wisdom for Bogle who was struggling a bit? Stuniverse: I wouldn't say Jayden Bogle struggled but, like most young players making their debuts do, he did some good things and made a few mistakes. Maybe I was over-protecting him but I thought Andre Wisdom's experience would be good for us in the last half an hour or so as I didn't want Jayden put under too much pressure this early in the season. I'm fortunate to have two good, but completely different right-backs and they'll both be needed. Andre was unlucky not to start but I just thought it was important to start the first match of the season positively and I felt Jayden's youth and energy would help us do that and it did. I'd like to take this opportunity to thank our amazing fans. Reading is a long journey on a Friday night when they could've stayed at home and watched it on TV or in the pub. To hear around 1,200 of them singing and bouncing in the second half really helped us over the line. 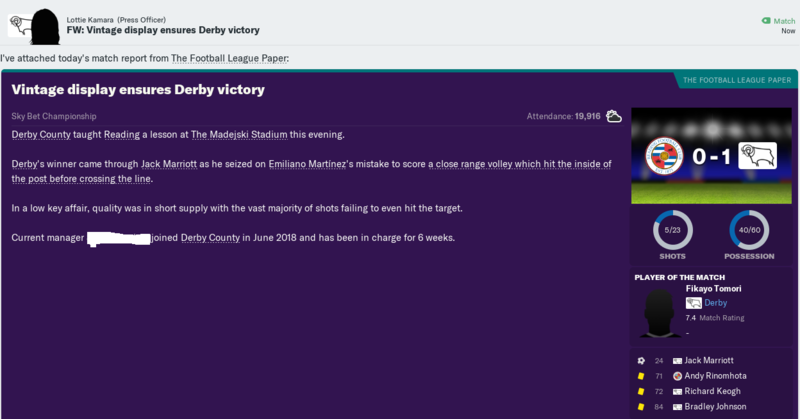 It really lifted the players and hearing them sing, "We're Derby County, we're top of the league!" made the hairs on the back of my neck stand on end. RamsFanzine: The transfer window closes a week today at 17.00, can we expect much business from Derby County? Stuniverse: That's more of a question for Igor than me but given the turnover of players both in and out this transfer window before we got here I'm not expecting too much. RamsFanzine: You and Igor must talk about this kind of thing, is there anything you're aware of? Stuniverse: I think you know Joe Bateman has gone to Guiseley on loan. In the positions he plays [CB / DM / CM] we have plenty of senior cover and much as I want to give youth a chance here, I couldn't see Joe getting much game time other than at U23 level. He's out-of-contract in the summer and needs to kick-on this season playing men's football. We spoke to Joe and he agreed so Igor sorted a loan for him. If Joe plays like he did for us against Alfreton he'll do well at Guiseley and then we can look at the situation at the end of the season. 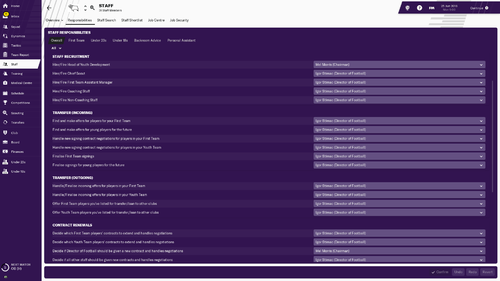 RamsFanzine: Anything else in the pipeline? Stuniverse: There's been some loan interest in Jayden Mitchell-Lawson, Josh Barnes, Lee Buchanan and Tyree Wilson but no decisions have been made yet. 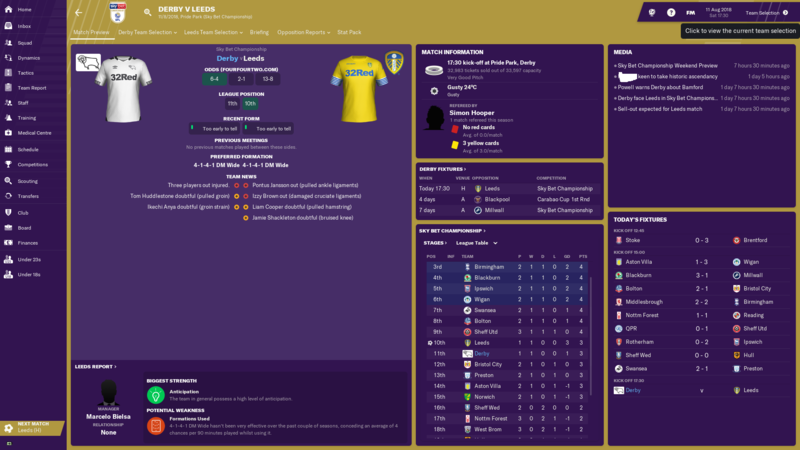 RamsFanzine: What about senior players in or out? Stuniverse: Igor's constantly working on that but there's nothing of substance worth talking about. Stuniverse: Well you have better sources than me then and I work here. RamsFanzine: So you can't confirm that? Stuniverse: No. There's nothing happening with Stoke to the best of my knowledge. RamsFanzine understand that long-serving Derby County player Craig Bryson is on the verge of joining Stoke City this transfer window. Bryson joined Derby County in 2011 and had his best season in 2013/14 when he scored 16 goals, helping the Rams reach the Championship playoff final where they lost 1-0 to QPR. Bryson, who is out-of-contract at the end of the season, spent last season on loan at Cardiff City, helping them gain promotion to the Premier League. Bryson is on record as saying he loves Derby County and would never play for another English side (joking that Cardiff are Welsh) and it is thought he'd return to Scotland if and when his Rams career comes to an end but, with his position in the Rams side under threat from loanees Mason Mount and Andy King, and Derby needing to offload players to bring new ones in, a move to Stoke City could benefit all parties. Stoke City manager Nathan Jones confirmed after his side's defeat to Leeds United that he would love to add Bryson to his squad and that the clubs are in negotiations to make that happen. Nobody from Derby County was available to comment. Uh oh, big deals being done behind your back. Ominous (although actually, it's how the DoF challenge works). RamsFanzine understand that young Derby County goalkeeper Josh Barnes will join Spanish side Real Union on loan until the end of the season. Real Union play in the Spanish Second Division B2. Barnes will reunite with a familiar face in Spain as his Derby U23 teammate Alex Babos is also on loan at Real Union. Babos has made three substitute appearances for Real Union so far this pre-season. Both Babos and Barnes are out-of-contract at the end of the season. 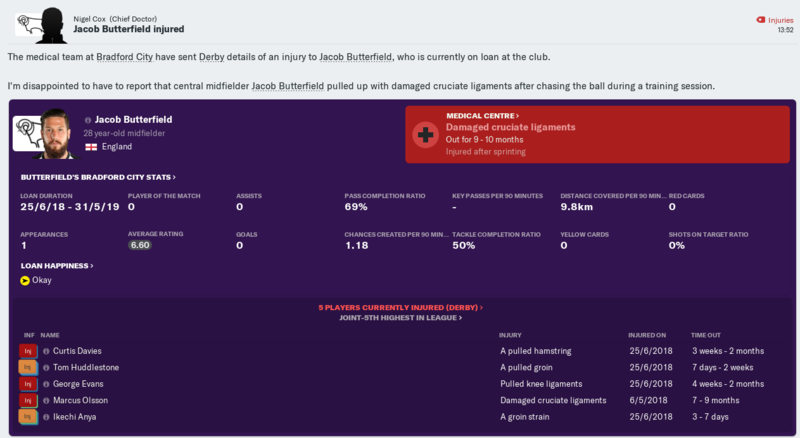 RamsFanzine have learnt that Jacob Butterfield has damaged cruciate ligaments in training with Bradford City and now looks set to miss the entire season. Butterfield is on loan from Derby County, who he joined from Huddersfield Town in the summer of 2015. After spending last season on loan at Sheffield Wednesday, Butterfield expressed his delight a few weeks ago at joining his hometown club on loan and was talking up the possibility of signing permanently for the Bantams when his Derby County contract expires at the end of the season. This injury represents a significant setback to that ambition. A spokesperson for Bradford City has said that Derby County have declined their option to terminate the loan deal preferring to let Butterfield rehabilitate at Valley Parade. 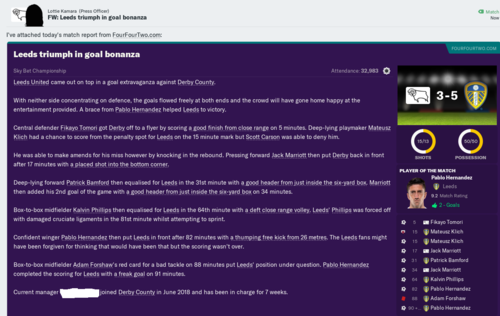 In a surprisingly quiet transfer deadline day for Derby County, RamsFanzine report there were three players going out on loan for the season and no players arrived. Tyree Wilson joined Chelmsford in the Vanarama National League South, Jayden Mitchell-Lawson joined Bradford Park Avenue in the Vanarama National League North, and Lee Buchanan joined Solihull Moors in the Vanarama National League. All three players are contracted to Derby County until the end of the season. Although Craig Bryson remains a Derby County player, for now, RamsFanzine understand Stoke City manager Nathan Jones remains keen to sign the Scottish midfielder and is weighing up a loan bid before the loan transfer deadline later this month. 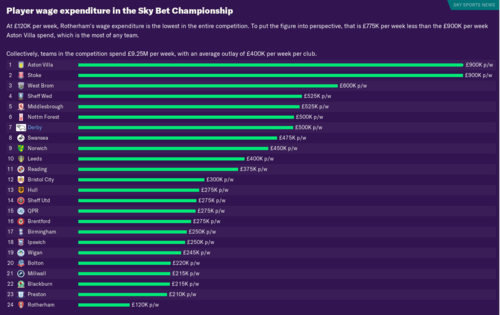 In a report published today, RamsFanzine can report that Derby County are spending £500,000.00 per week on player wages which puts them joint 6th in the Sky Bet Championship. RamsFanzine: Derby County have confirmed season ticket sales of 22,500 ahead of your first home match of the Championship season. What do you make of that? Stuniverse: I think it's incredible and shows how much the city of Derby and surrounding areas love their football club. I'm a lifelong Rams fan so it doesn't surprise me, but I don't want to ever take the support for granted. We saw last time out at Reading how the backing of the fans can lift the team and we're going to need that support this season. It's our job to give them something to cheer, starting today against our rivals Leeds United. RamsFanzine: You've gone with the same starting 11 and bench as the Reading game. What's your thinking behind that? Stuniverse: To be honest it was a no-brainer as the team played so well at Reading and we've had eight days between the last match and this one. The 11 who started against Reading deserve to keep their shirts and go again. RamsFanzine: Were any of the injured players close? Stuniverse: No, that's pretty much unchanged. Ashley Cole (calf), Efe Ambrose (thigh) and Duane Holmes (knee) are getting closer but after the performance at Reading I saw no reason to rush any of them back. The rest are still some way off. Stuniverse: I'm disappointed, of course, to have lost the game but I thought there were some very positive signs. We led 1-0, 2-1 and 3-2 and we really should've got something out of the match from there. If you're not going to win it, make sure you don't lose it. 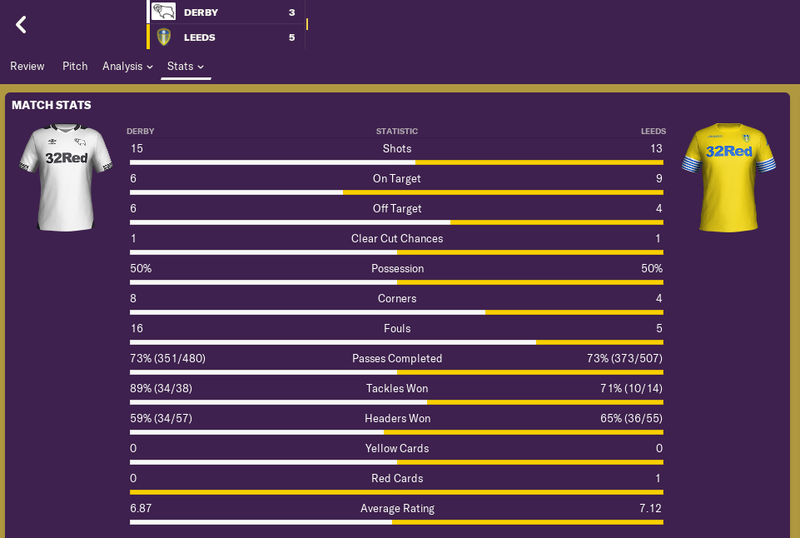 We had more shots than Leeds, but they had more on target than us and that was probably the difference, they were more clinical in front of goal than us. When you score three goals at home you shouldn't be losing. RamsFanzine: Where do you think it went wrong? Stuniverse: We made too many individual mistakes and didn't defend well enough. 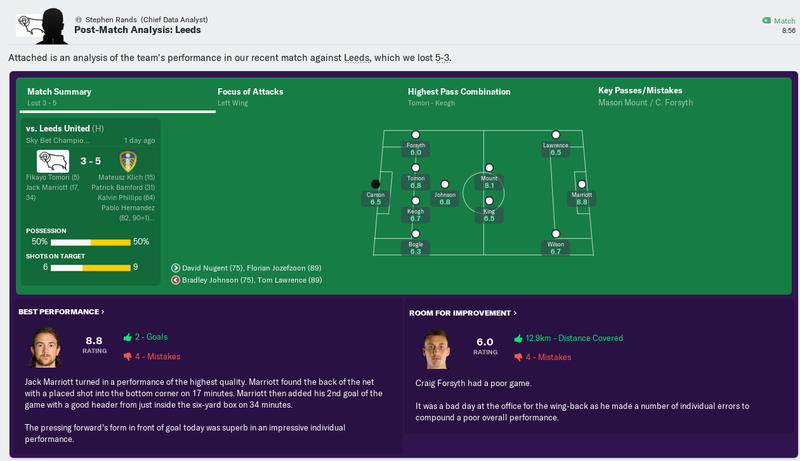 Fozzy conceded a needless penalty for their first goal and, even then, Scott saved the penalty but Klich scored from the rebound. 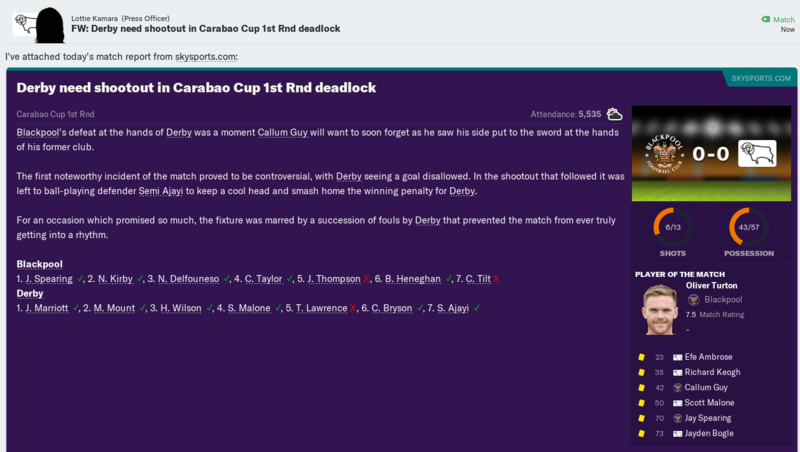 We left Bamford unmarked for a free header for their second equaliser and we allowed Phillips too much time and space in our penalty area for their third equaliser. Credit to Hernandez though, his stunning free-kick to give them a 4-3 lead would've beaten any goalkeeper in the world. Their fifth goal was just freakish bad luck as a clearance cannoned in off Hernandez. We'll work on our defending in training but I'm not too worried as defensively we've looked solid in pre-season and Reading hardly caused us any problems last week. RamsFanzine: At 3-3 you replaced Johnson with Nugent and changed from 4-1-2-3 to more of a 4-4-2. What was your thinking there? Stuniverse: Simple. At 3-3, with 15 minutes to go, I wanted to win the match and thought putting two up top would give us a better chance of winning. It didn't work out so, maybe, that was a mistake. If we'd kept the same shape, got a draw, and taken four points from our first two matches that would've been fine. If you average four points every two games over 46 matches you'll end the season in the top two more often than not. But it was Leeds, historical rivals of ours going back to the Brian Clough-Don Revie days. I wanted to win the match and I'm disappointed that change back-fired. 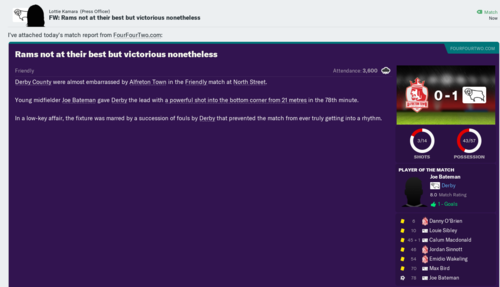 RamsFanzine: And they finished the match with 10-men? Stuniverse: Yes, they did. And it was a definite red card, that probably stopped us making it 4-4. Forshaw knew what he was doing. But on 88 minutes it was too late to make any difference. And that kind of sums the match up. Leeds were more clinical and streetwise than us. We were naive at times, and I include myself in that. But we'll work hard on the training ground and we'll try and do better next time. RamsFanzine: You've made seven changes for tonight, what's your thinking behind that? Stuniverse: We've used the same 11 players in both matches so far, but the days when you can simply pick the same 11 match after match are long gone. 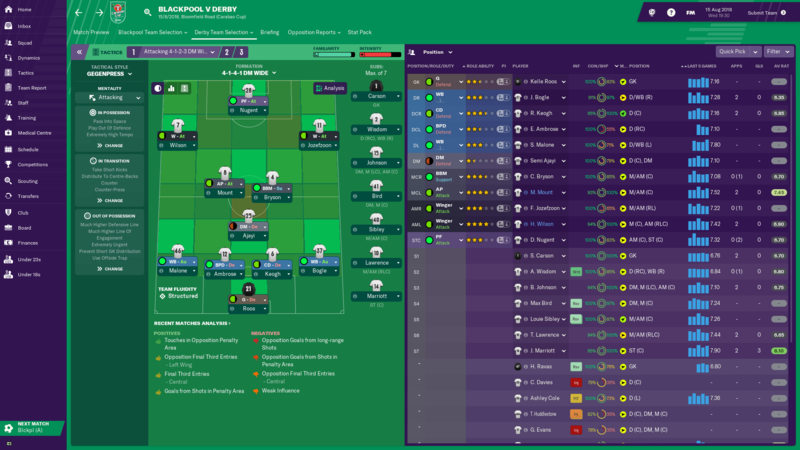 It's a squad game now but in order to do that you need to get as many players match fit as possible. So this is an opportunity to give some players who've missed out up to this point some playing time. Stuniverse: Fozzy will be the first to admit he didn't have the best of games against Leeds and we've talked about that. I'm fortunate to have three experienced left-backs in Fozzy, Ashley Coe and Scott Malone. In all fairness I couldn't look Ash and Scott in the eye and not bring one of them in after that and Fozzy understands that. Scott's been waiting patiently, not even making the bench, whilst Ash is still coming back from injury. Scott gets the nod. RamsFanzine: Any news on the injury front? Stuniverse: Well Efe Ambrose is fit enough and gets a start tonight. Ashley Cole and Duane Holmes were close, but not close enough. The rest are still some way off. 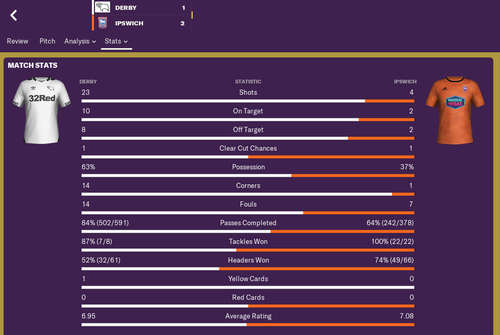 Derby win 6-5 on penalties. Stuniverse: We're through to the next round and that was the objective tonight. Blackpool made things tough for us but I thought we did enough to win the match in 90 minutes. And I thought we had late on when Craig Bryson put the ball in the net from close range, only for it to be ruled out for offside. I've watched it back a few times now and I'm not convinced. The ball goes into a crowded six-yard box, Bryson doesn't look offside to me and slots it away, Tom Lawrence who's nowhere near the ball may, or may not, be offside but the thing is you see those situations every week and sometimes the goal's given and sometimes it's not. I thought we did well, although we laboured at times. We looked livelier after Jack Marriott and Tom Lawrence came on. RamsFanzine: Roos was great in the penalty shootout and gave you not one but two chances to win it. Stuniverse: Yes, Kelle Roos made two great saves to set-up Tom Lawrence and then Semi Ajayi to win it. I'm not going to criticise any player for missing a penalty in a shootout because it's a tough, high pressure situation and it takes a lot of courage to put your hand up and say you'll take a penalty. But when Tom missed, I did wonder if it wasn't going to be our day. But after Kelle's second save, all the pressure was on Semi and he took his penalty well. I was pleased for him because he's had to wait for his chance and, when it came it wasn't in his normal position. With Tom Huddlestone and George Evans out injured, Bradley Johnson's been playing the holding role but it's not his preferred position either, so I thought I'd see how Semi got on there. He did well enough to give me something to think about and scoring the winning penalty is something he'll remember for the rest of his life. RamsFanzine can reveal that young Rams defender Calum Macdonald will be joining Vanarama National League Wrexham on loan until the end of the season. Macdonald's current Derby County contract runs out in the summer. RamsFanzine watched the draw for the 2nd Round of the Carabao Cup and can announce that Championship Derby County will visit Premier League Leicester City on Wednesday 29 August. 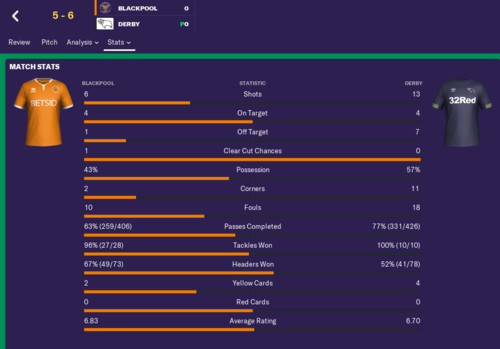 In the 1st Round of the Carabao Cup, Derby County beat Blackpool 6-5 on penalties, after a 0-0 draw at Bloomfield Road. As a Premier League club, Leicester City enter the Carabao Cup at the 2nd Round Stage. 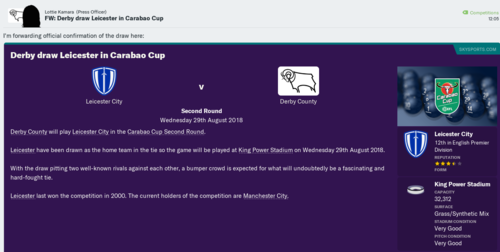 RamsFanzine understand that the Derby County Board expect the Rams to reach the 3rd Round of the Carabao Cup, meaning the Rams will need to produce a giant killing at the King Power Stadium to meet that expectation. Derby County have suffered an injury set-back today as RamsFanzine understands Mason Mount and Henrich Ravas pulled out of training after picking up injuries. Mount has a tight groin, Ravas a twisted knee, and both will be unavailable for selection for tomorrow's trip to Millwall in the Championship. RamsFanzine: What are your thoughts on drawing Leicester City away in the Carabao Cup? Stuniverse: I'd have preferred a home draw but I think it's a fantastic tie and will be a great test for us. Leicester isn't that far away so hopefully our fans can turnout in force. It's going to be a very difficult match for us though, Leicester are a very good Premier League side and, only a few short seasons ago, won the Premier League. That's the measure of the task we face. Stuniverse: I'm pleased to say things are improving on that front. Efe Ambrose (thigh), Ashley Cole (calf) and Duane Holmes (knee) are all back in full training and available for selection. 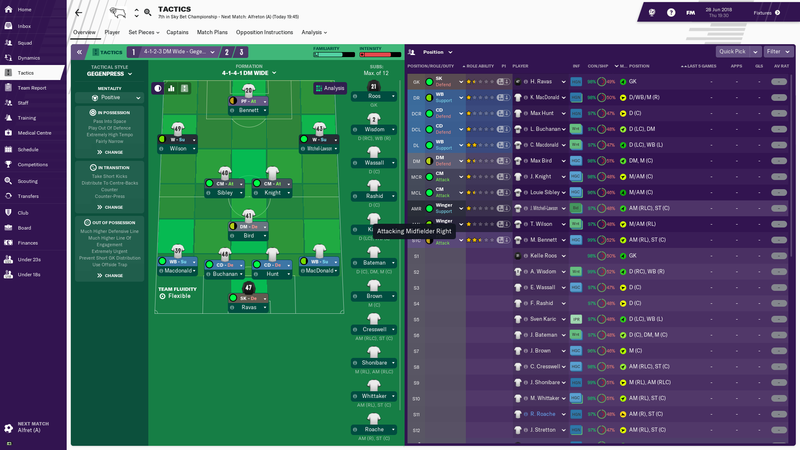 Martyn Waghorn (ankle), Mason Bennett (hamstring) and Ikechi Anya (groin) could all manage 45 minutes if we really needed, but I don't like putting players on the bench that aren't fully fit. If our medical staff advise 45 minutes, what happens if the player they're on the bench covering for gets injured after five minutes? Suddenly they have to play 85 minutes, not 45, and that's not fair and risks making their injury worse. Tom Huddlestone (groin) and Mason Mount (groin) aren't that far off. Curtis Davies (hamstring), George Evans (knee), Henrich Ravas (knee) and Marcus Olsson (ACL) are still some way off, Olsson a long way off. RamsFanzine: Six changes today, almost reverting back to the team that played against Reading and Leeds. Essentially Malone in for Forsyth and Bryson in for Mount. Stuniverse: Yes. Mason Mount picked up a groin injury in training yesterday but if he was fit I'd have had a decision to make between Craig Bryson and Andy King but I didn't have to decide in the end as they both start. 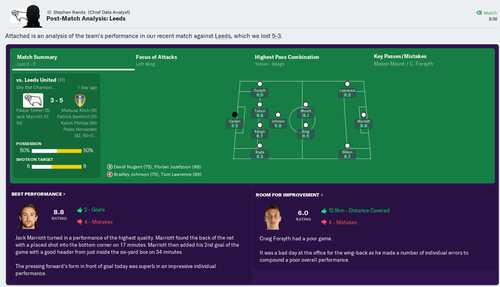 Craig Forsyth had a below par match against Leeds, whereas Scott Malone did well against Blackpool and keeps his place. was a fantastic performance. Five different goal scorers as well - Jack Marriott with a brace, Richard Keogh, Harry Wilson, Craig Bryson and Duane Holmes. 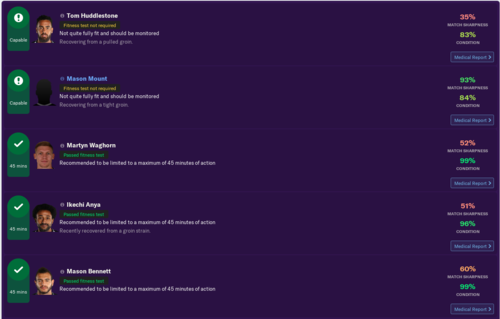 RamsFanzine: Marriott is on fire right now, isn't he? Stuniverse: Yes, he is. That's five now in three starts and a cameo as substitute. Not bad for a striker who was playing League One football last season. Stuniverse: Mason Mount (groin), Martyn Waghorn (ankle), Mason Bennett (hamstring) are back in training and in contention. Ikechi Anya (groin) could probably play 45 minutes if we needed. Tom Huddlestone (groin) and Henrich Ravas (knee) aren't that far off. Curtis Davies (hamstring) and George Evans (knee) will be a while yet and Marcus olsson (ACL) will miss most of the season. RamsFanzine: Two changes tonight. Mount for King and Cole for Malone, who doesn't make the bench. Is he injured? Stuniverse: Yes. 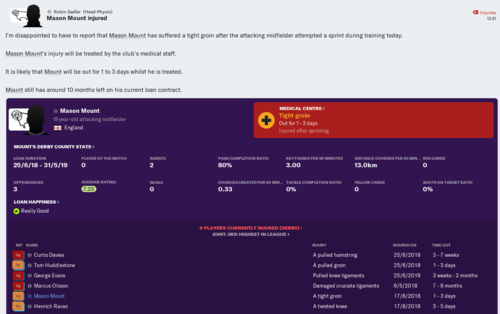 Mason Mount has recovered well from his tight groin and he comes straight back in. It was a tight call whether to leave Andy King or Craig Bryson out, but Bryson's looked sharper in training these last couple of days so I went with him. Scott Malone isn't injured, but he's been struggling for fitness since the Millwall match so Ashley Cole comes in and I've put Craig Forsyth on the bench as cover. 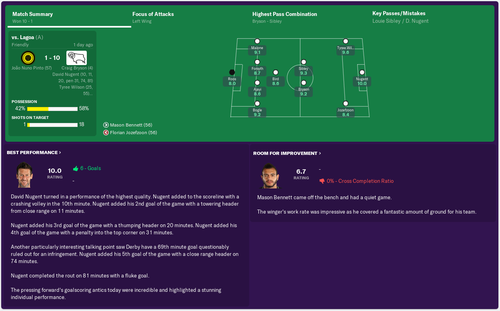 I was going to keep Duane Holmes on the bench but that meant we didn't have a single home grown club player so I named Mason Bennett as a sub, a little earlier than I would've liked. Stuniverse: I'm going to give their goalkeeper Bartosz Bialkowski a huge amount of credit tonight because he was sensational. 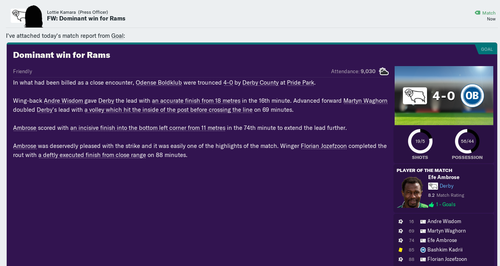 We had 10 shots on target to their two, and Bialkowski was the reason we only scored one goal. 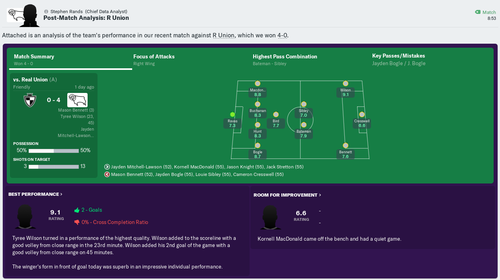 We also dominated possession so I can't be too hard on the players. Nine times out of 10 we win that match but, unfortunately for us, we came up against a goalkeeper in top form. 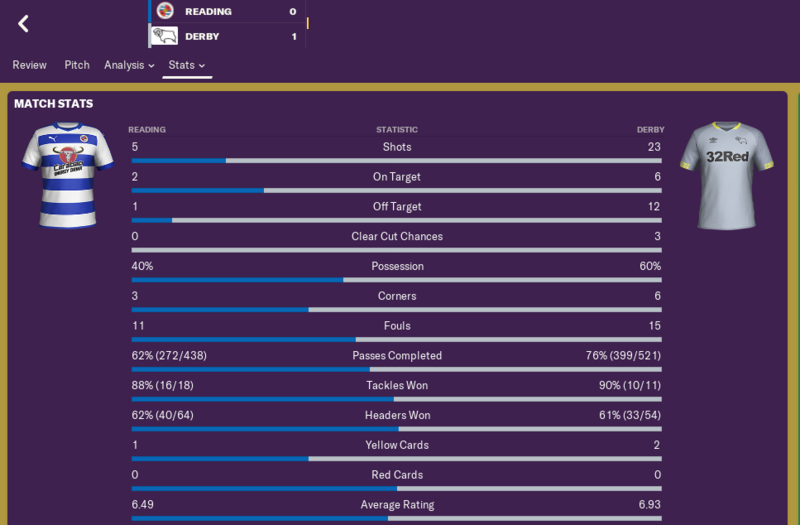 RamsFanzine: You've now lost both your home matches this season and, for the second time, you switched from 4-1-2-3 to 4-4-2 in the second-half only to concede a goal and go on to lose. Stuniverse: I can't argue with that assessment but against Leeds, and even more so tonight, we played well going forward and created plenty of chances. Of course it's a concern, but if we were playing badly, which we're not, and weren't creating chances, which we are, I'd be more concerned. We've just got to work harder on the training ground and be more clinical in matches.